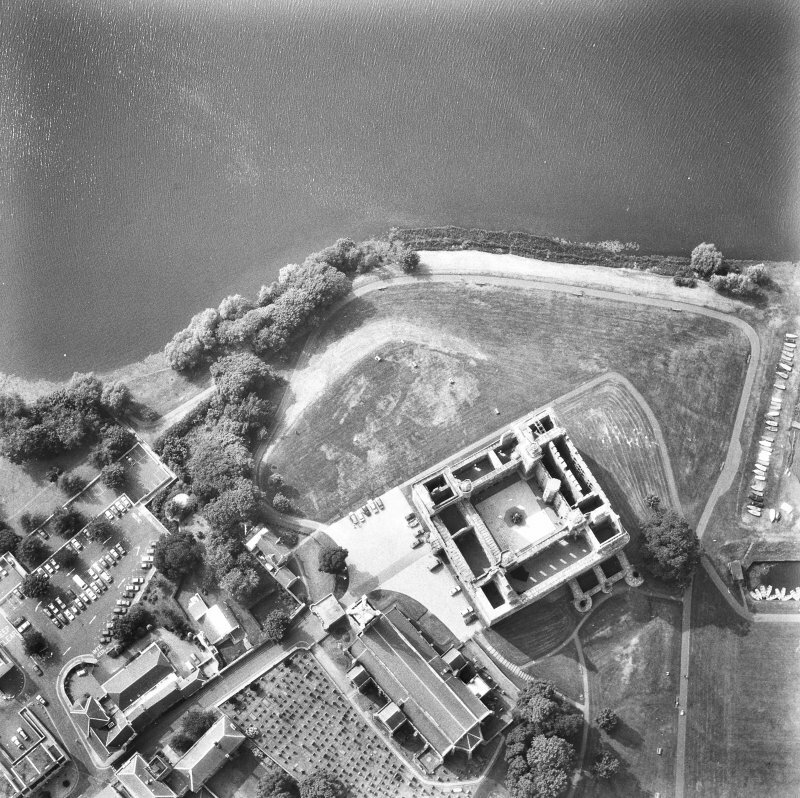 Drawing showing part plan, section and elevations. 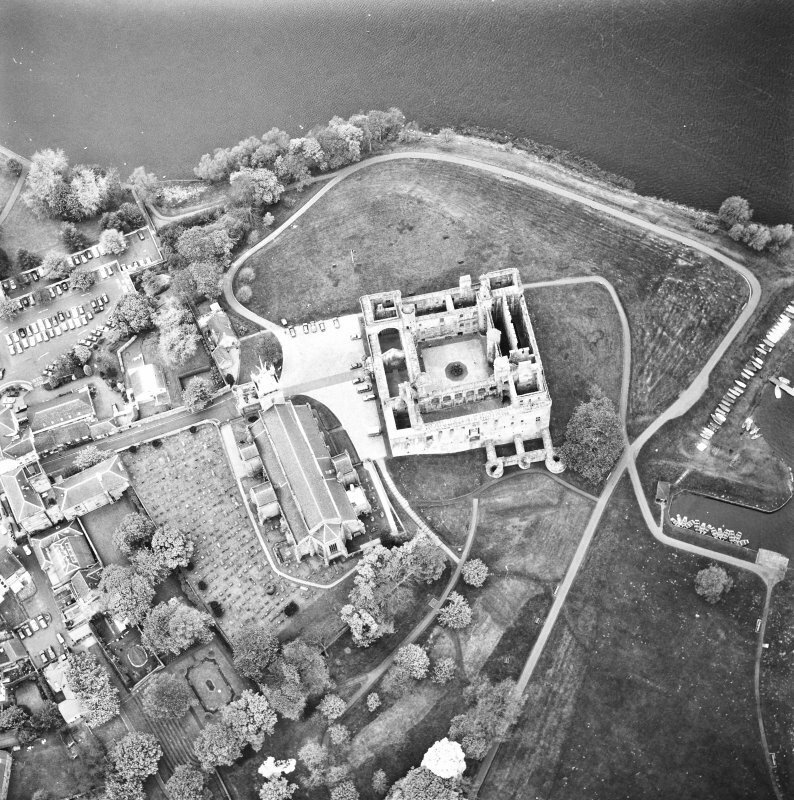 View of tower from NW. 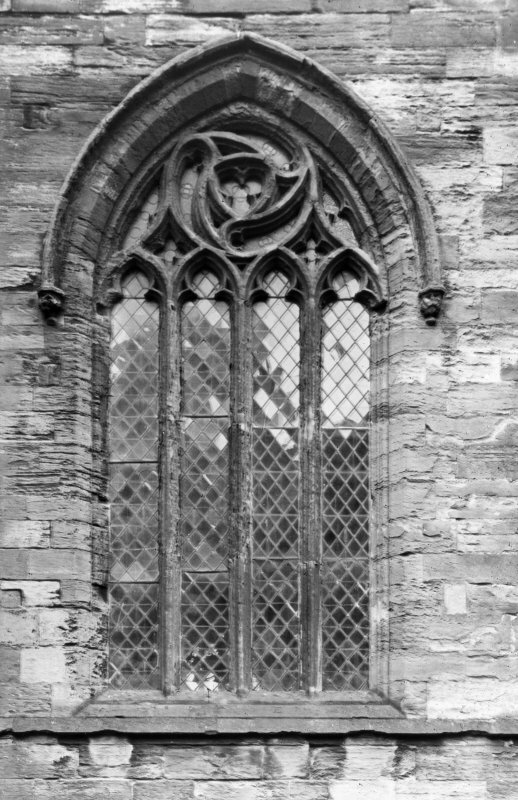 Detail of tracery on St Katherine's Aisle window. 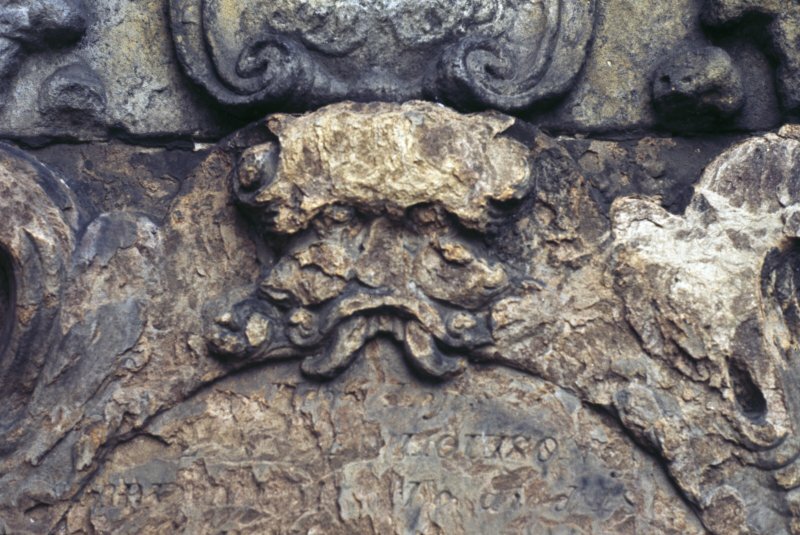 Detail of headstone with possible Green Man, St Michael's Church burial ground, Linlithgow. 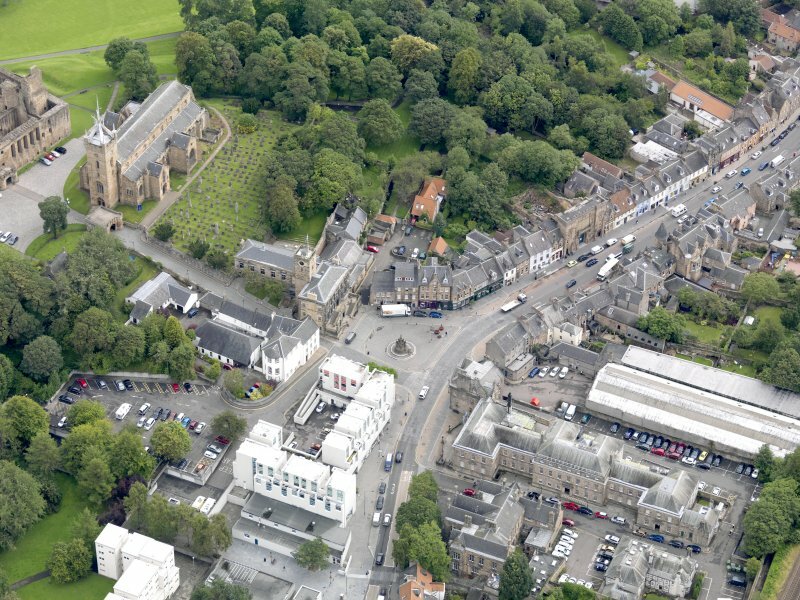 Oblique aerial view of Linlithgow High Street, centred on the market cross, taken from the SE. 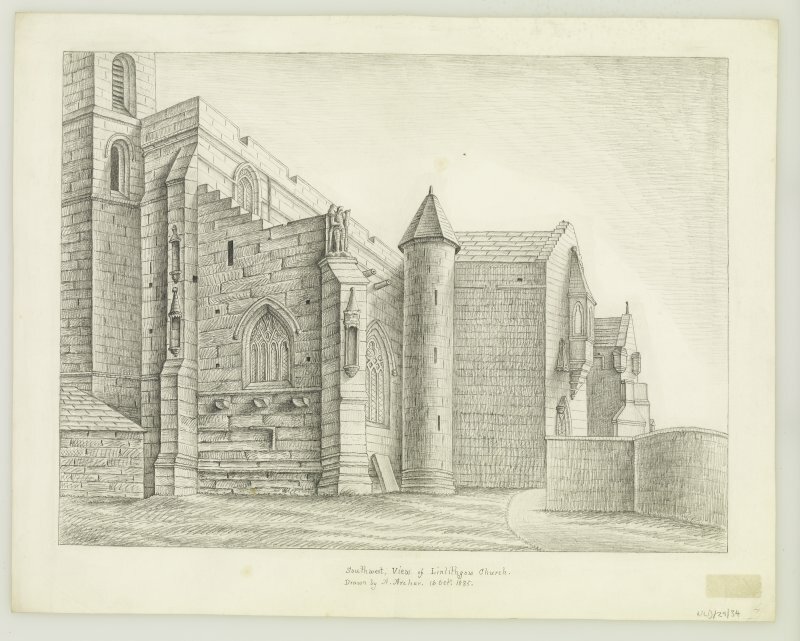 Photographic copy of drawing showing view from SW. 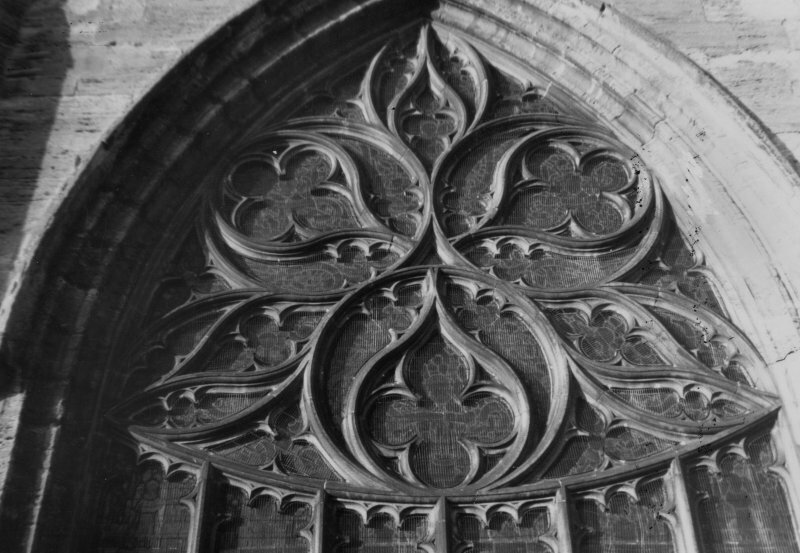 Detail of window on North Aisle. 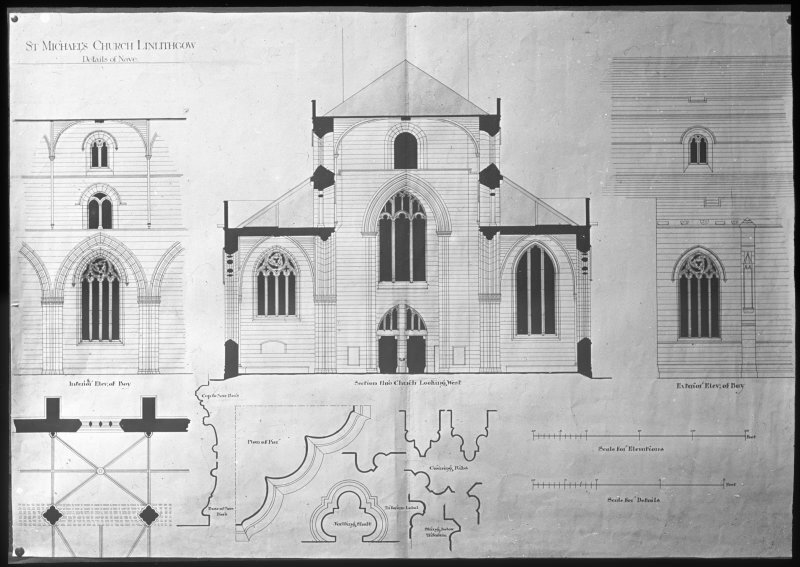 Drawing showing part plan, elevation and details of mouldings. 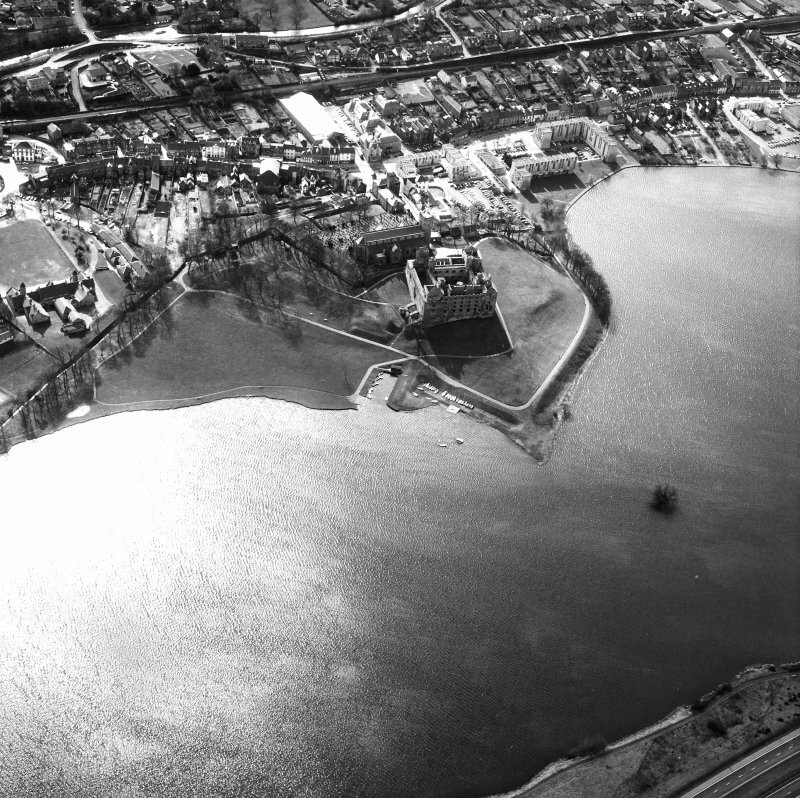 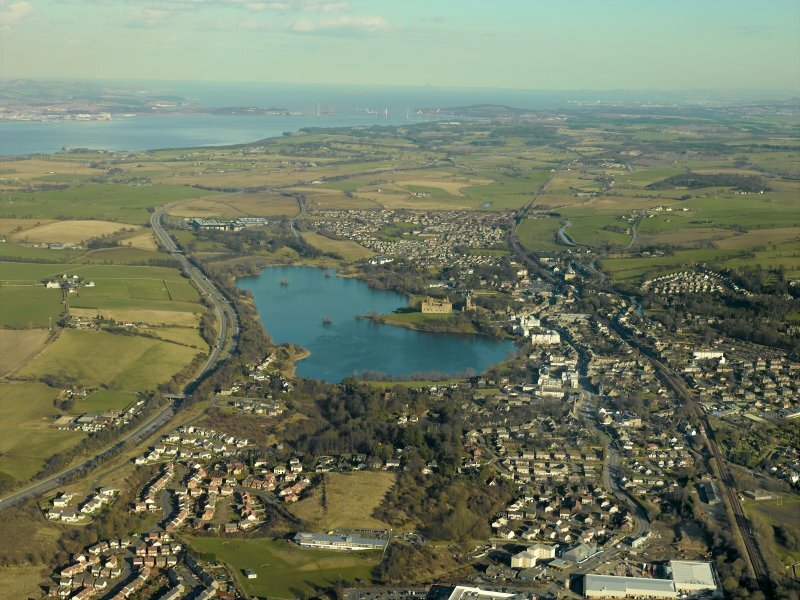 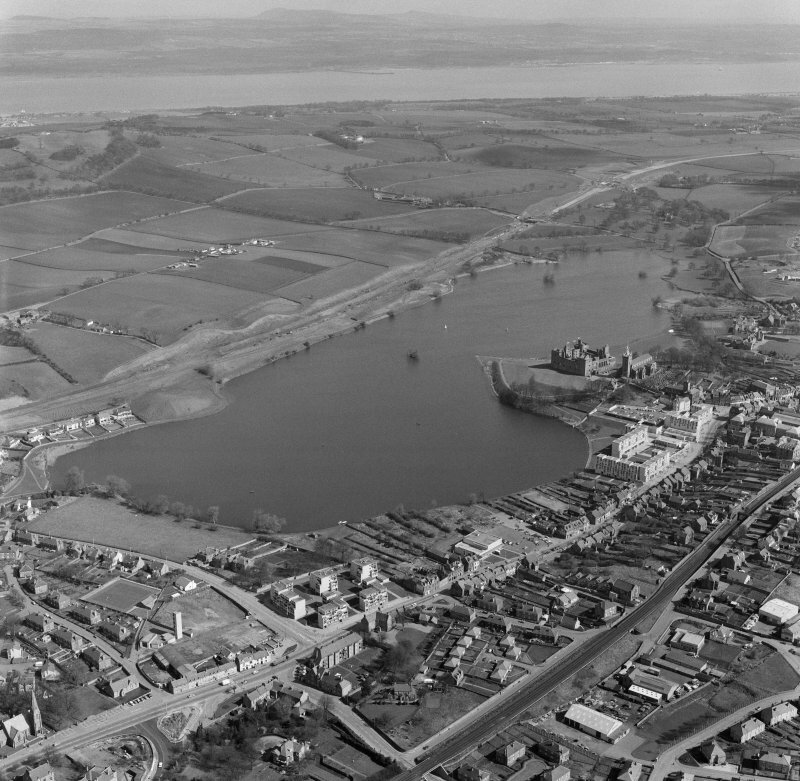 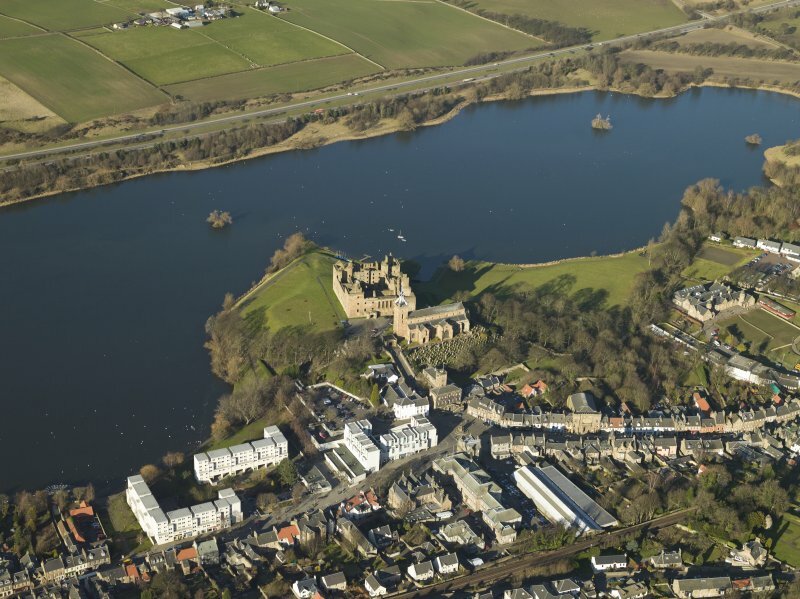 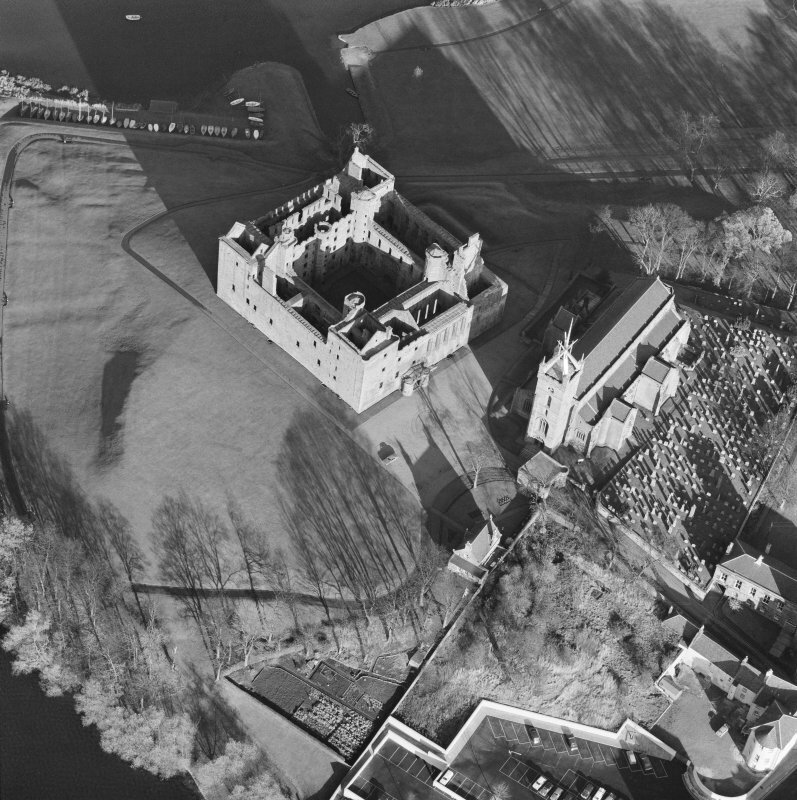 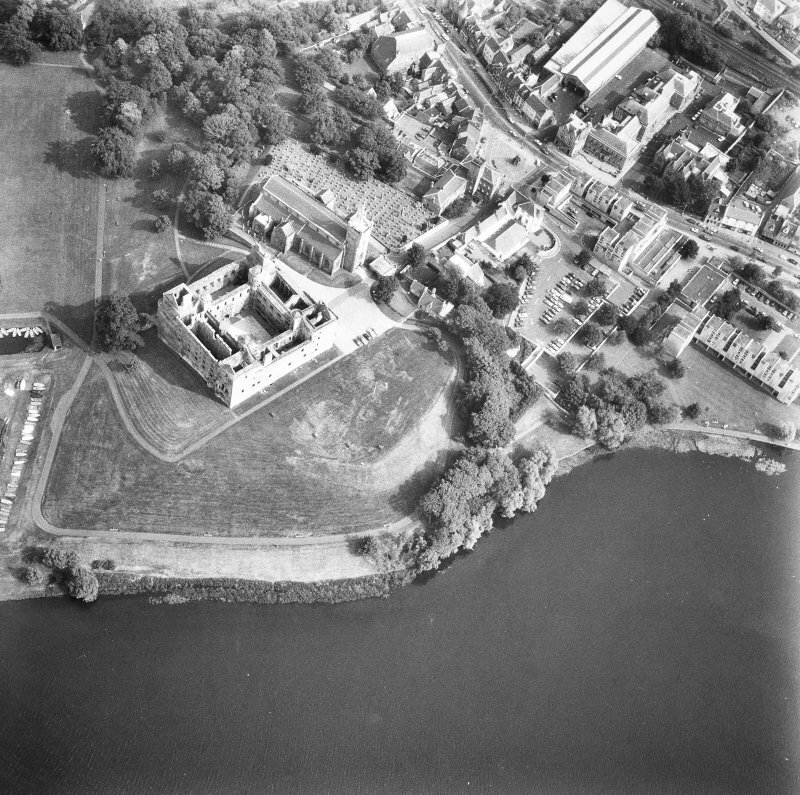 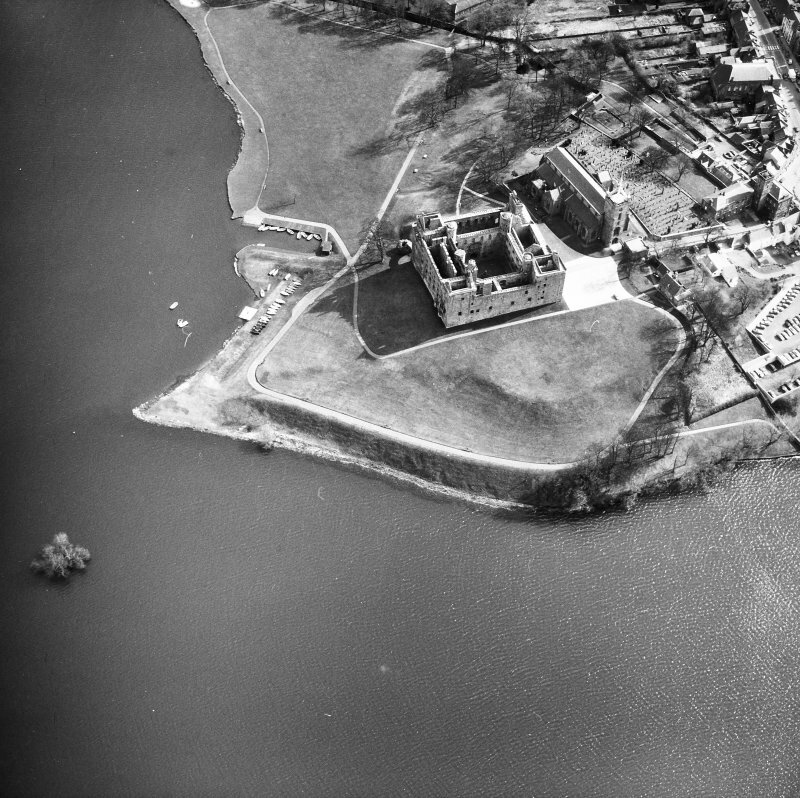 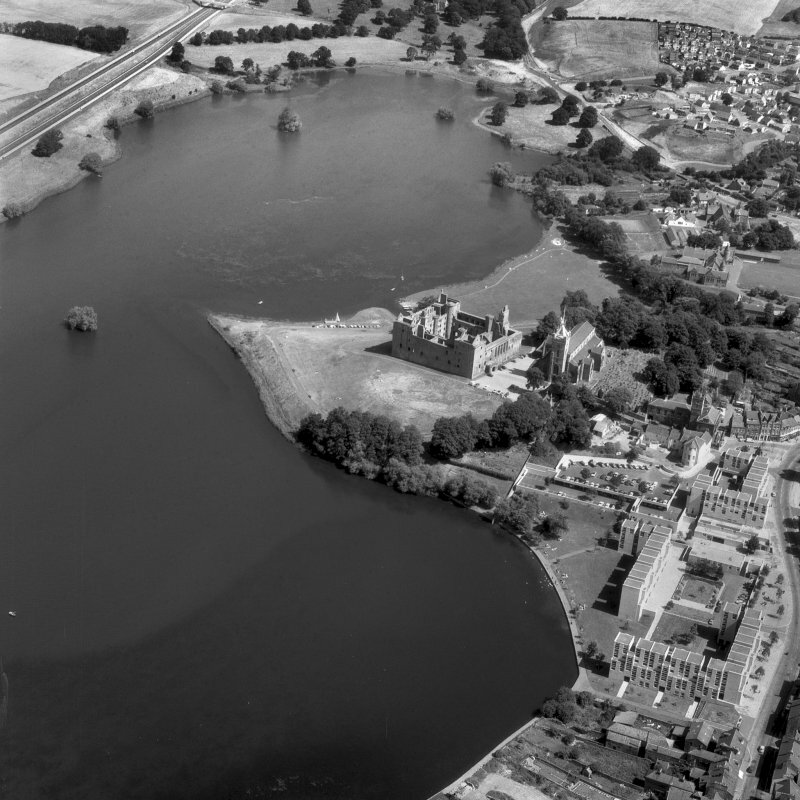 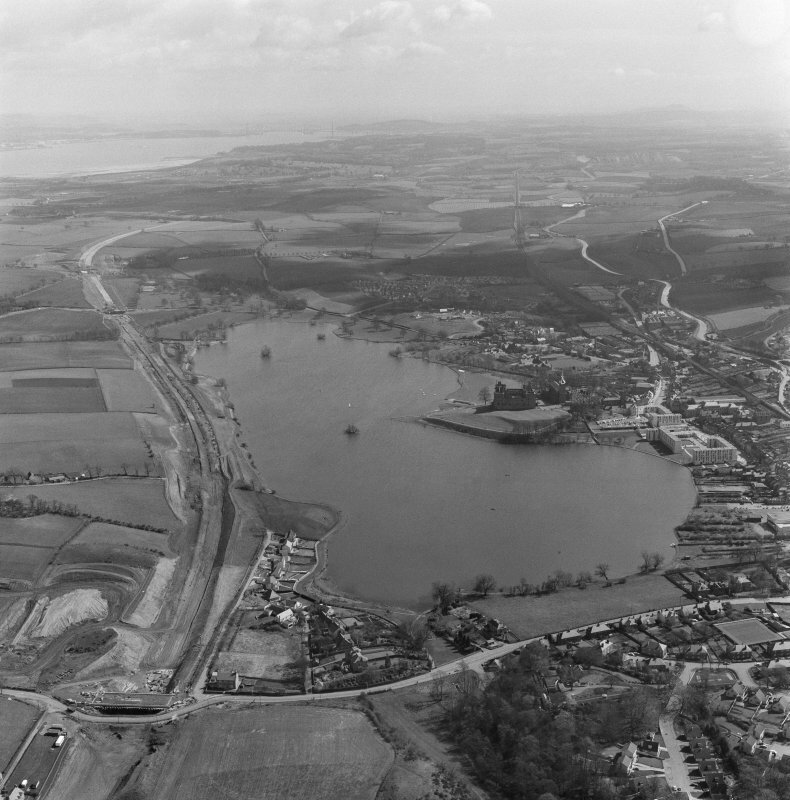 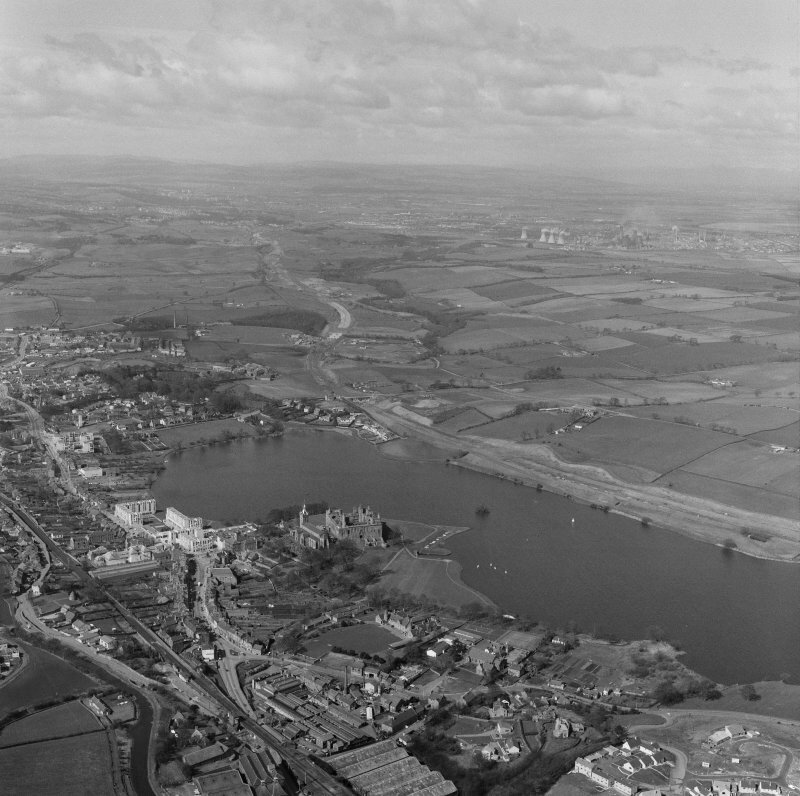 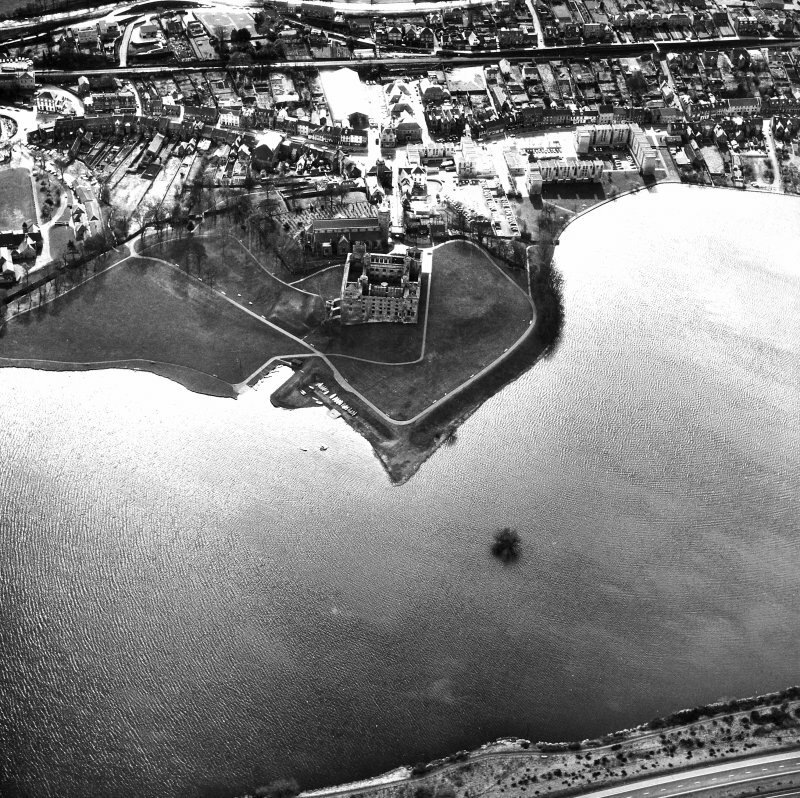 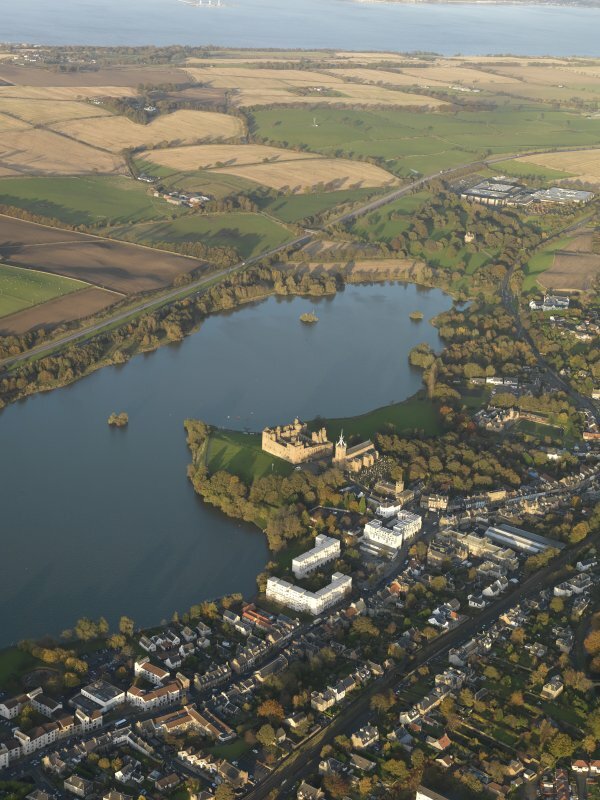 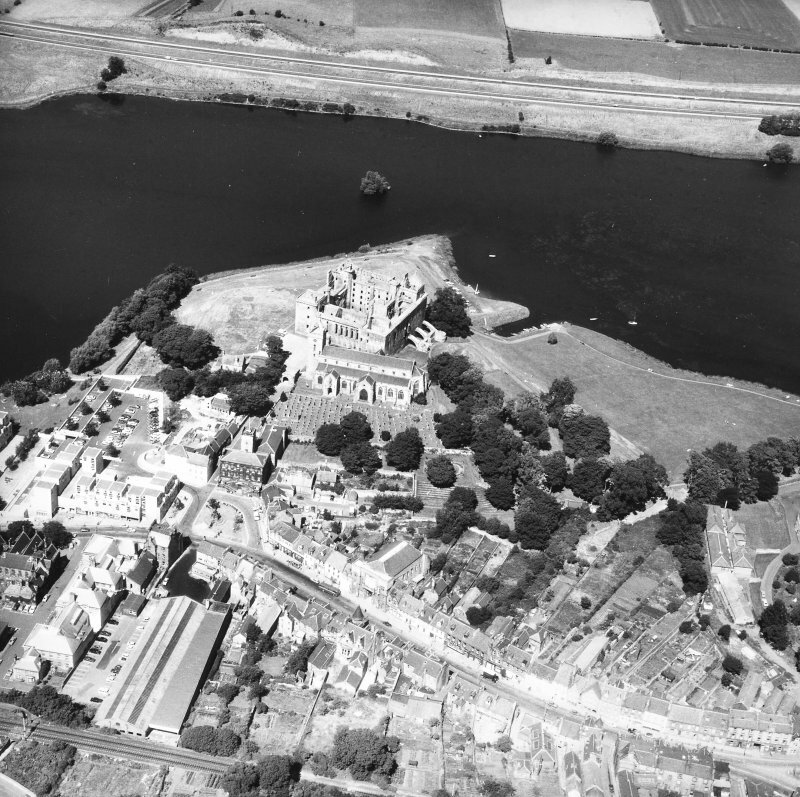 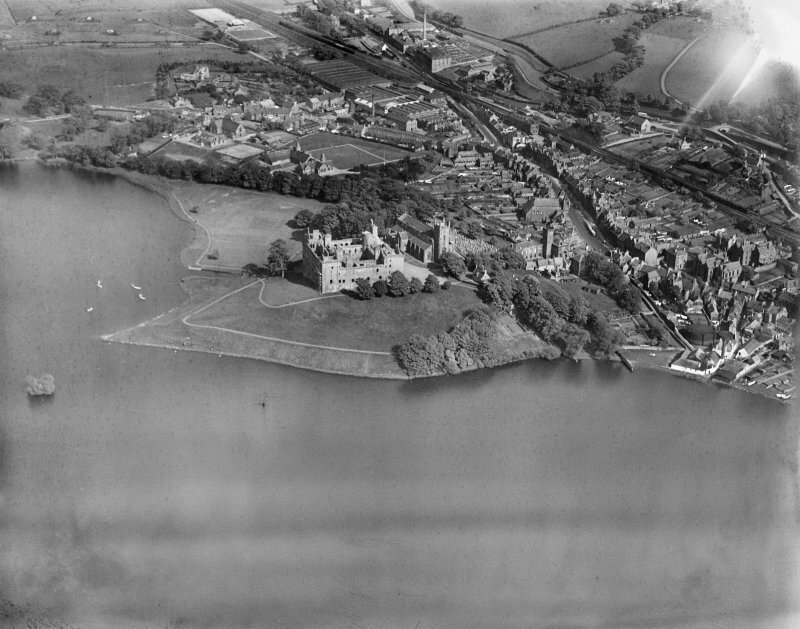 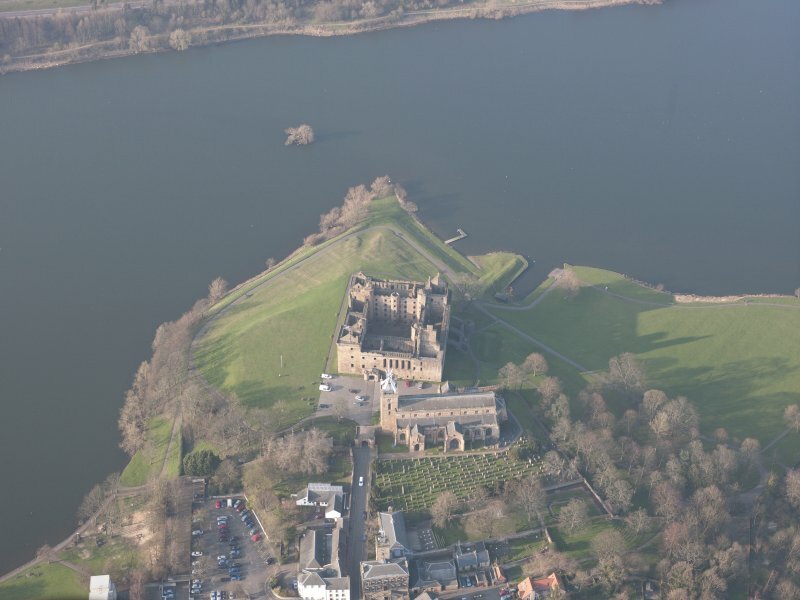 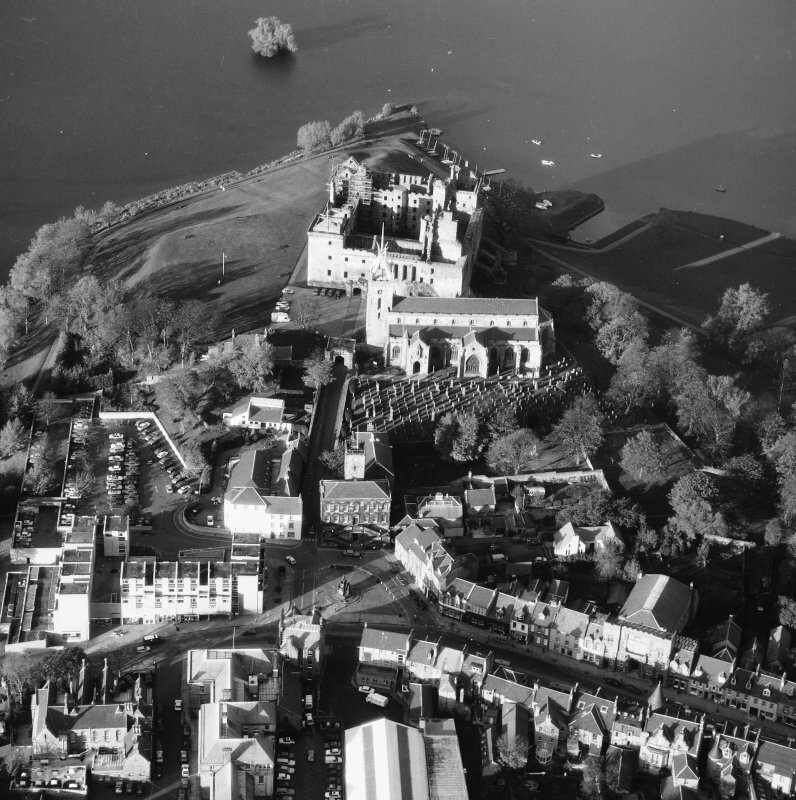 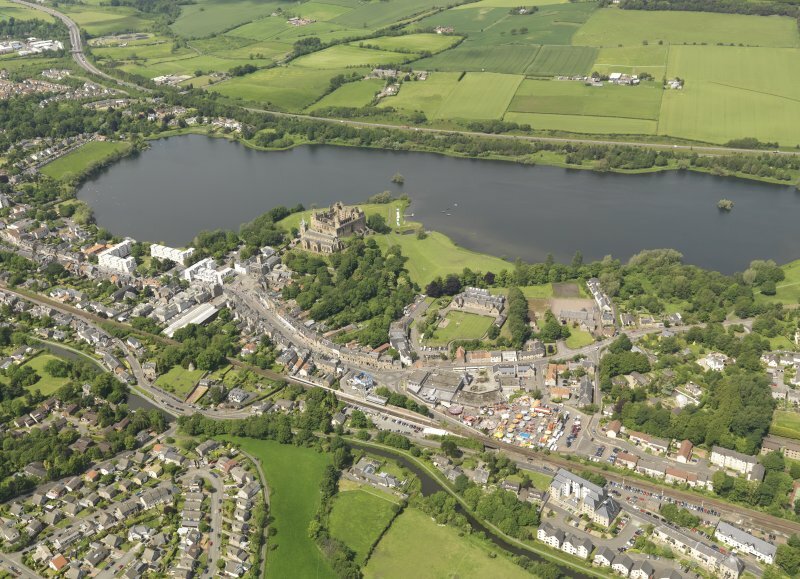 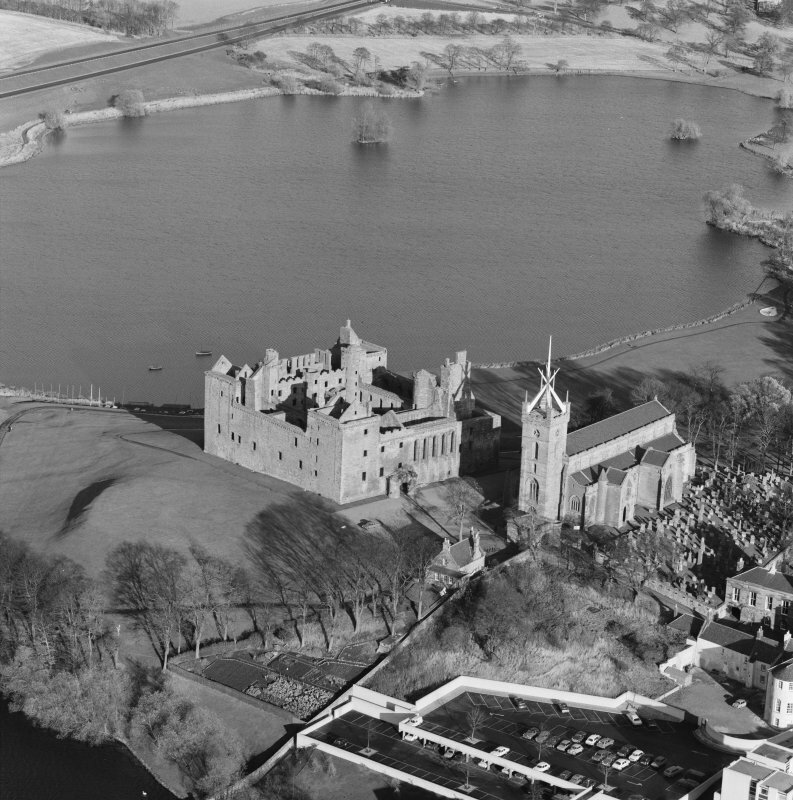 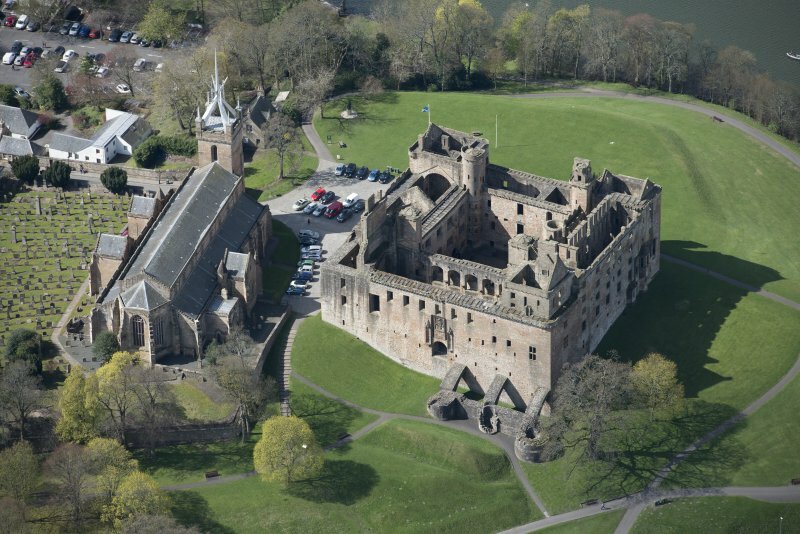 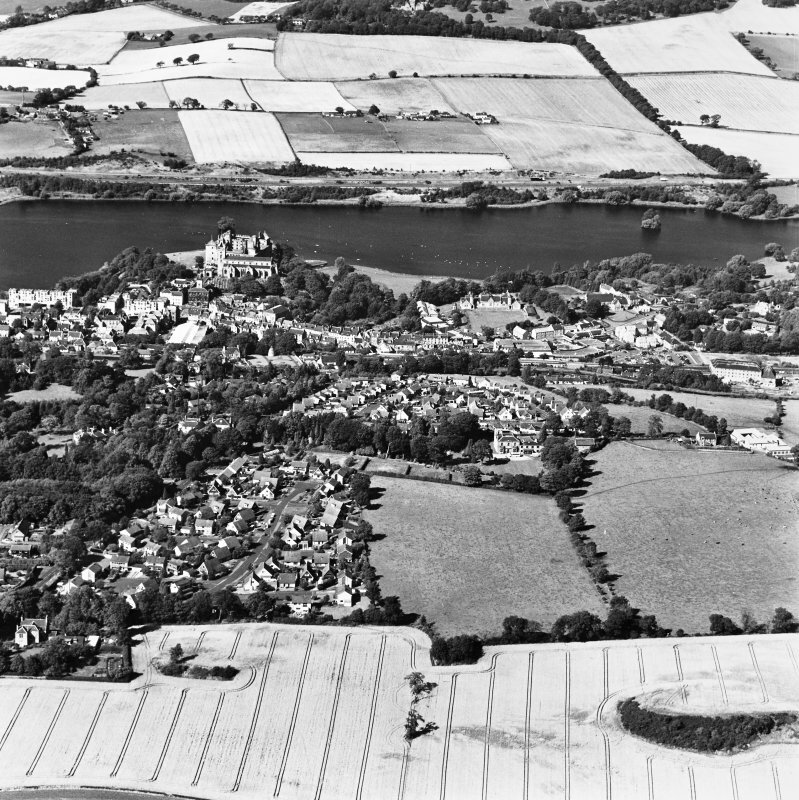 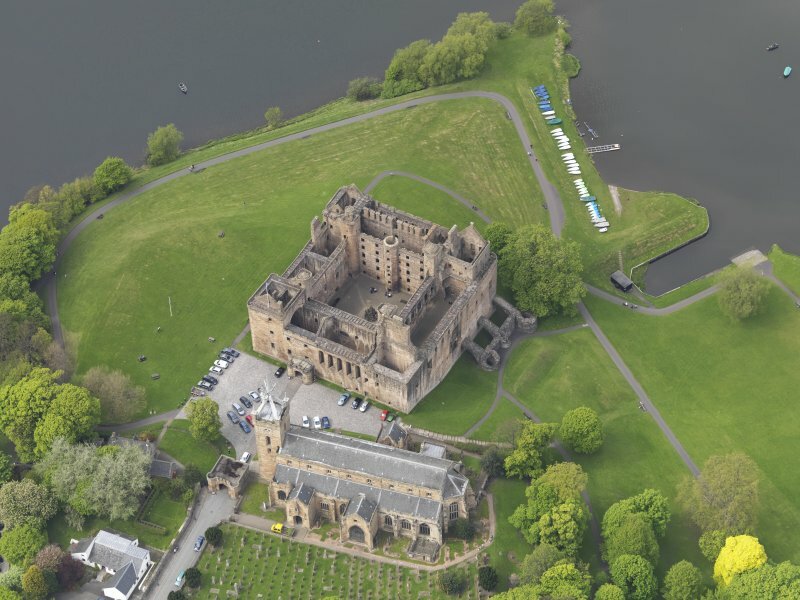 General oblique aerial view of Linlithgow centred on Linlithgow Palace, taken from the ESE. 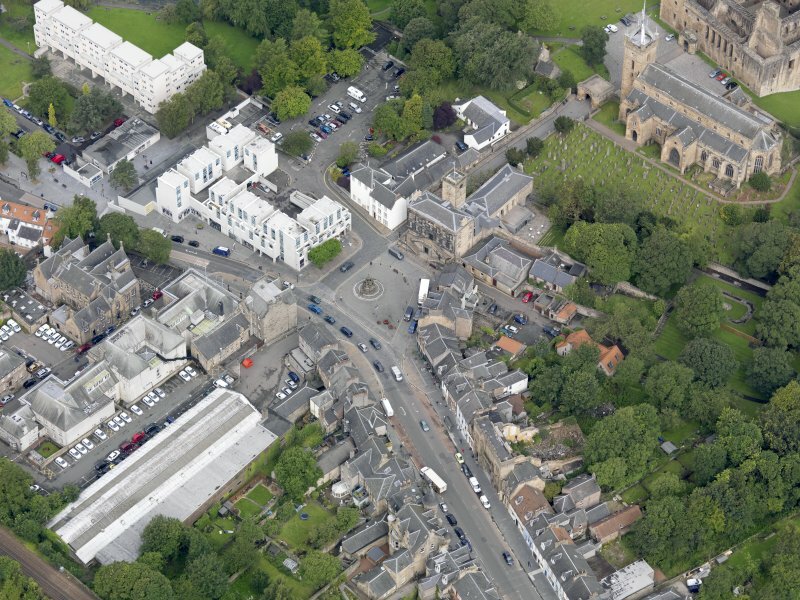 Oblique aerial view of Linlithgow High Street, centred on the market cross, taken from the WSW. 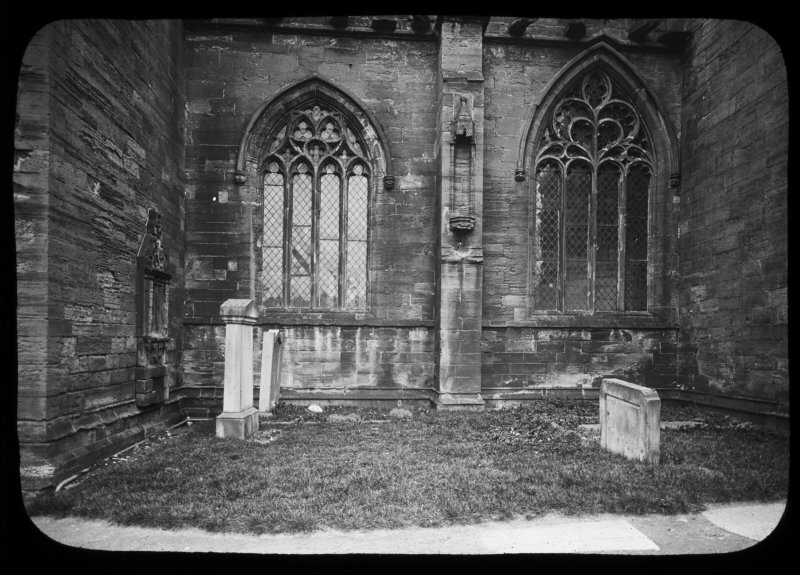 Detail of SW end of nave. 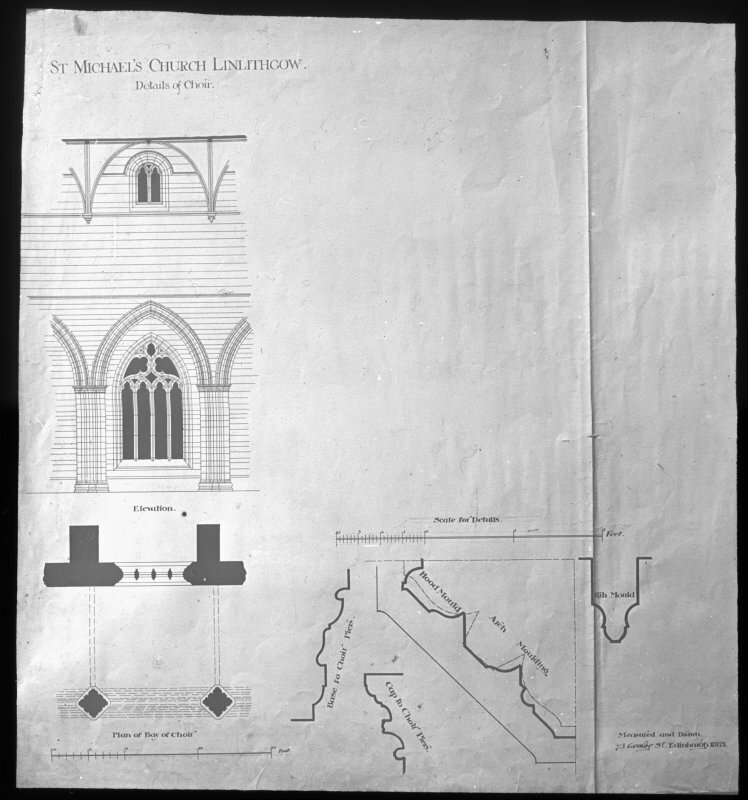 Scanned image of photographic copy of drawing showing view of steeple. 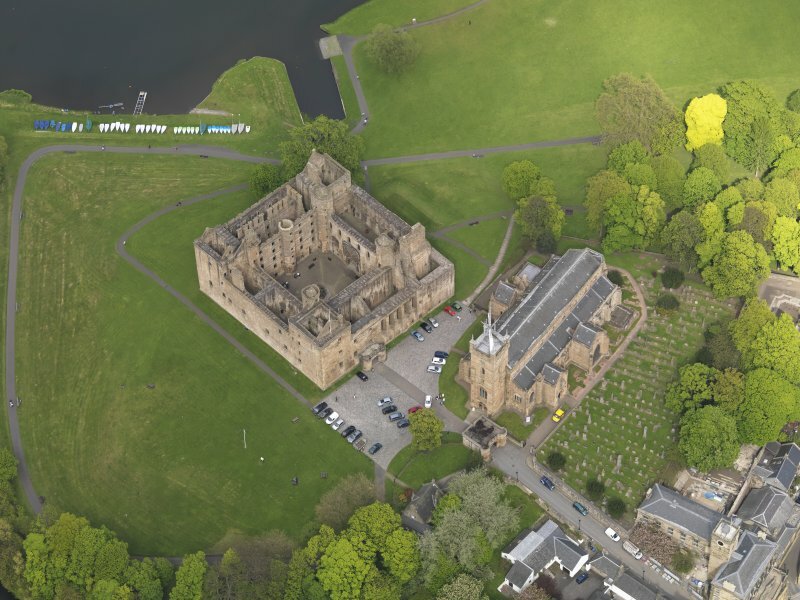 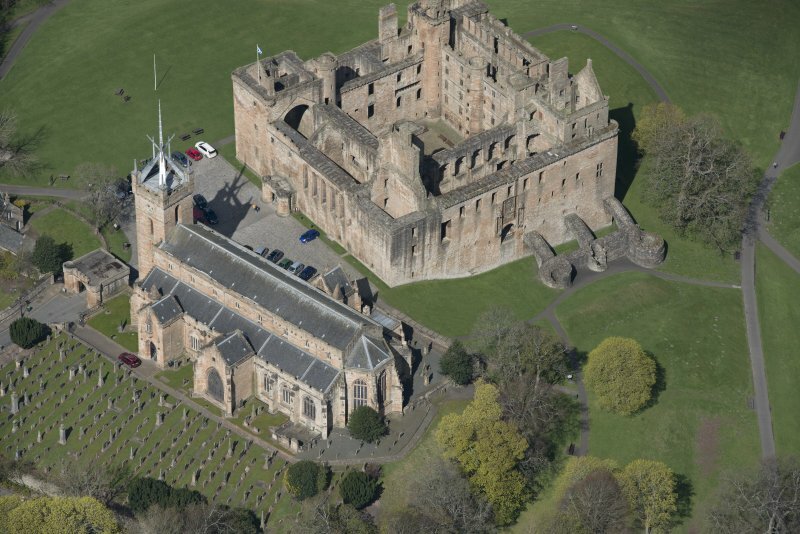 Oblique aerial view of Linlithgow Palace and St Michael's Church, looking NW. 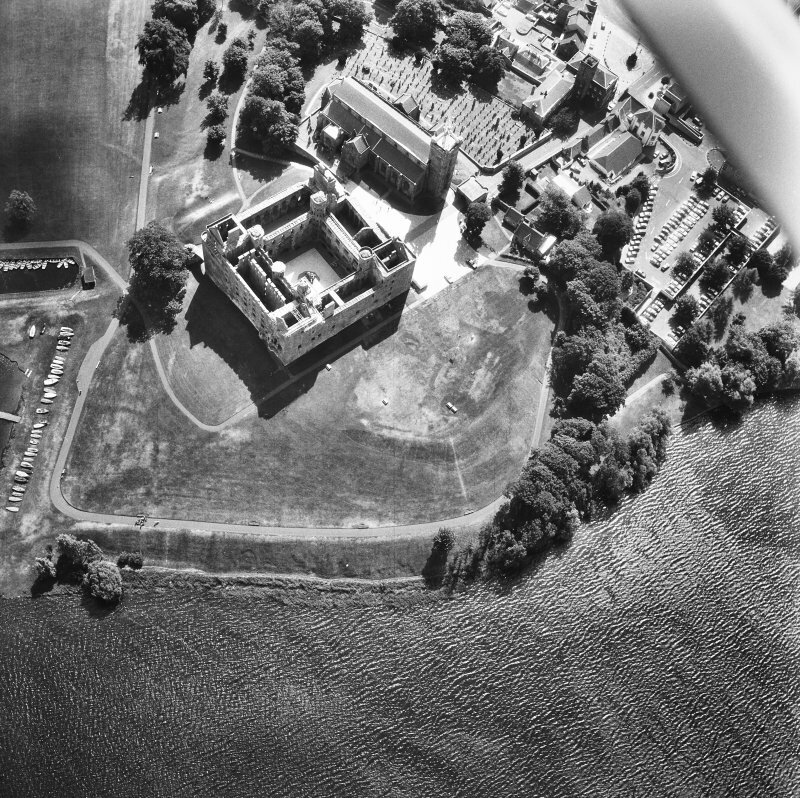 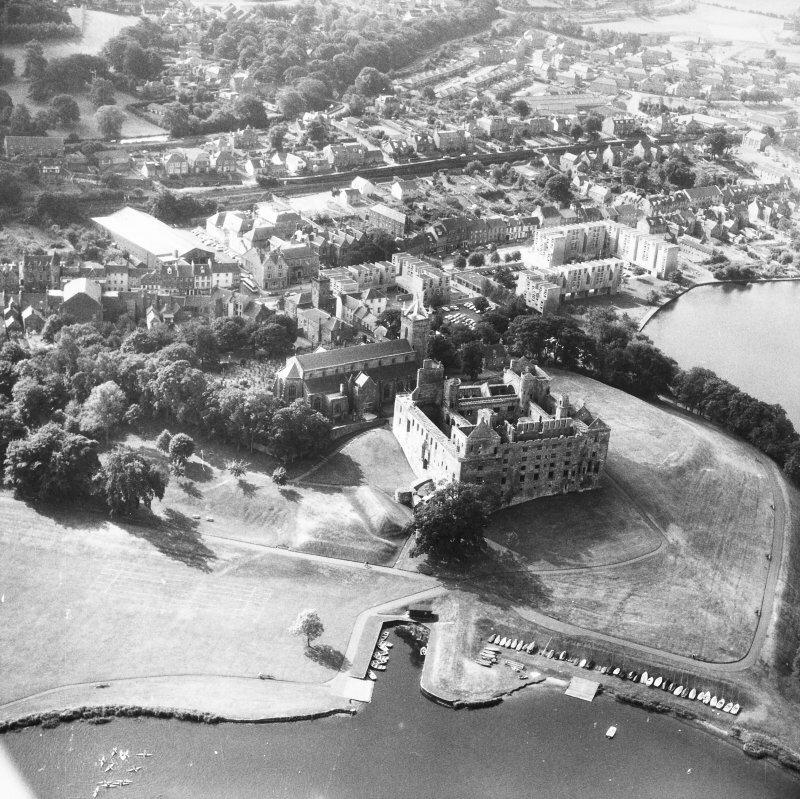 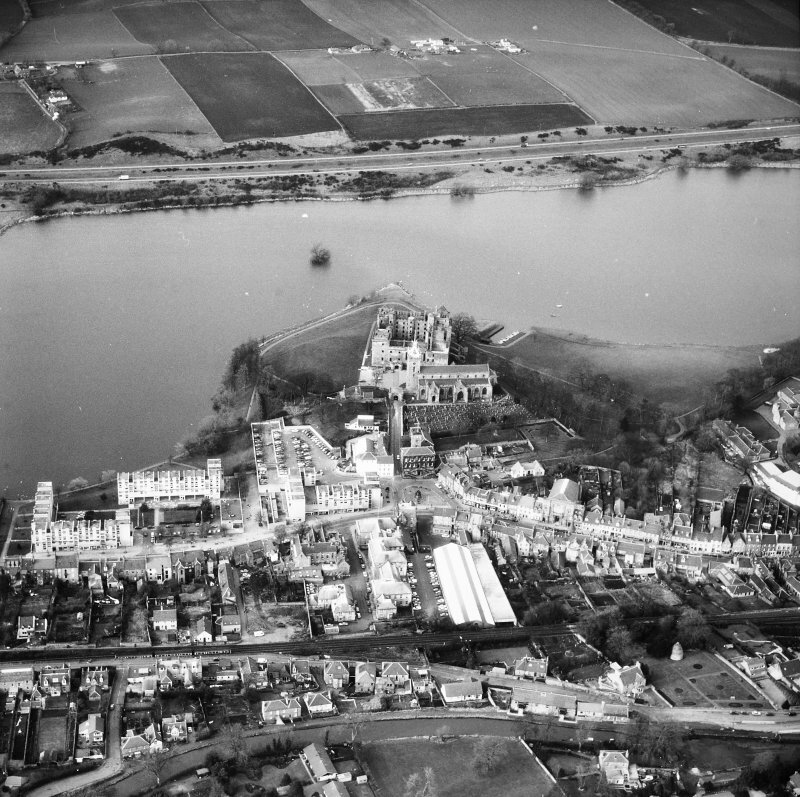 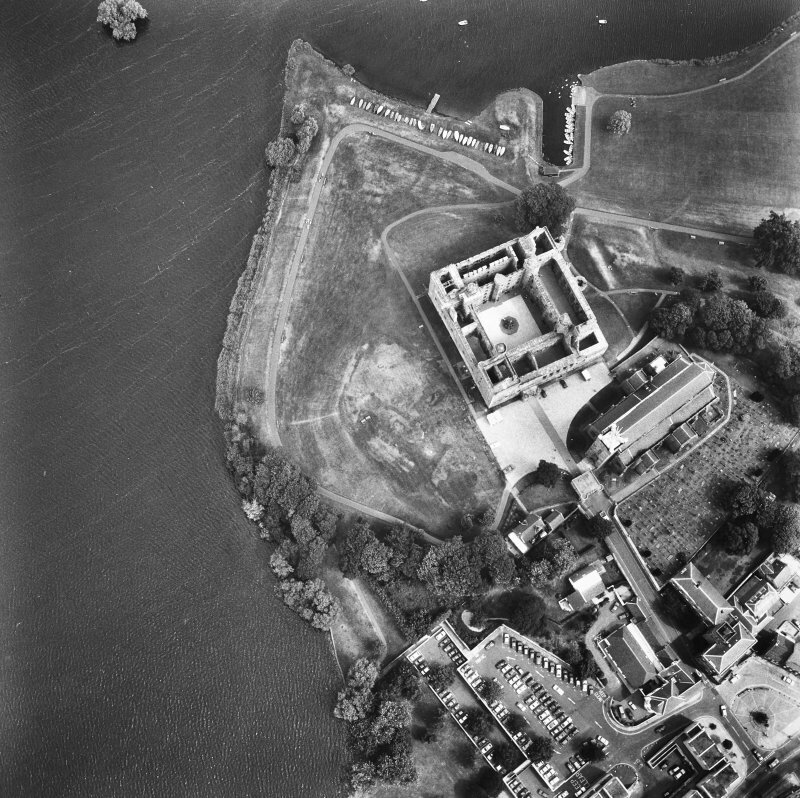 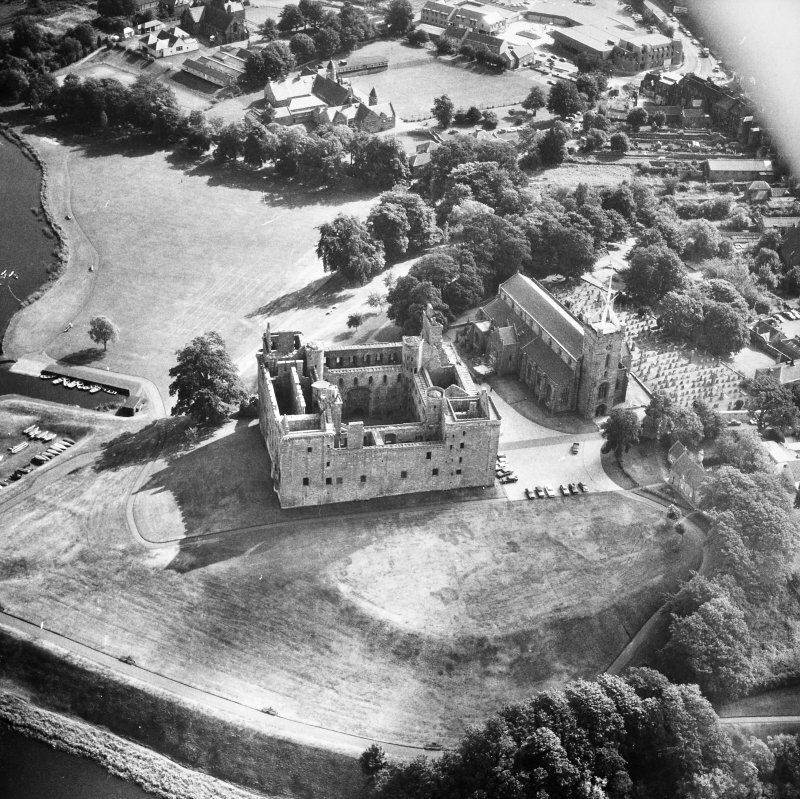 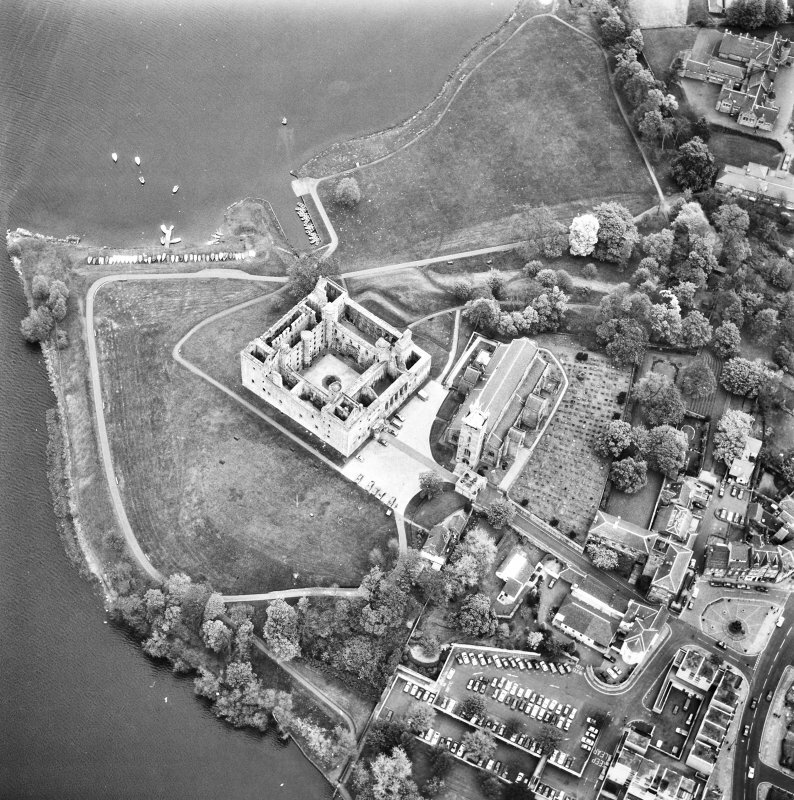 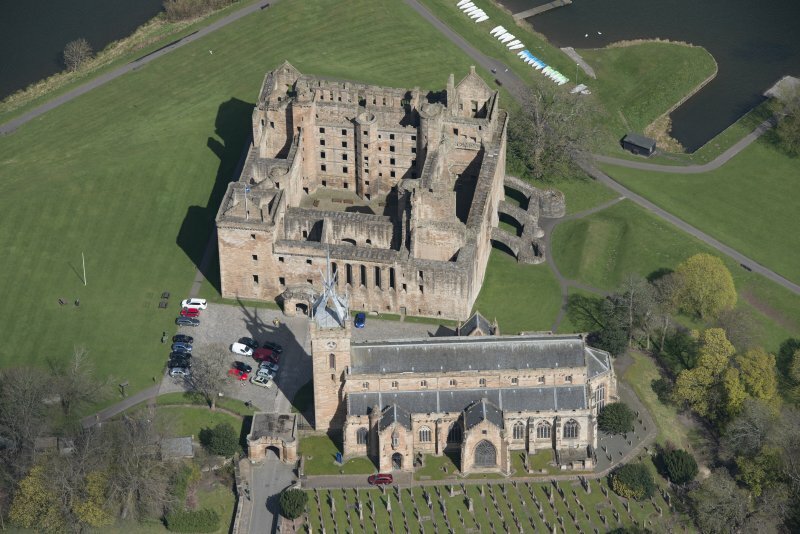 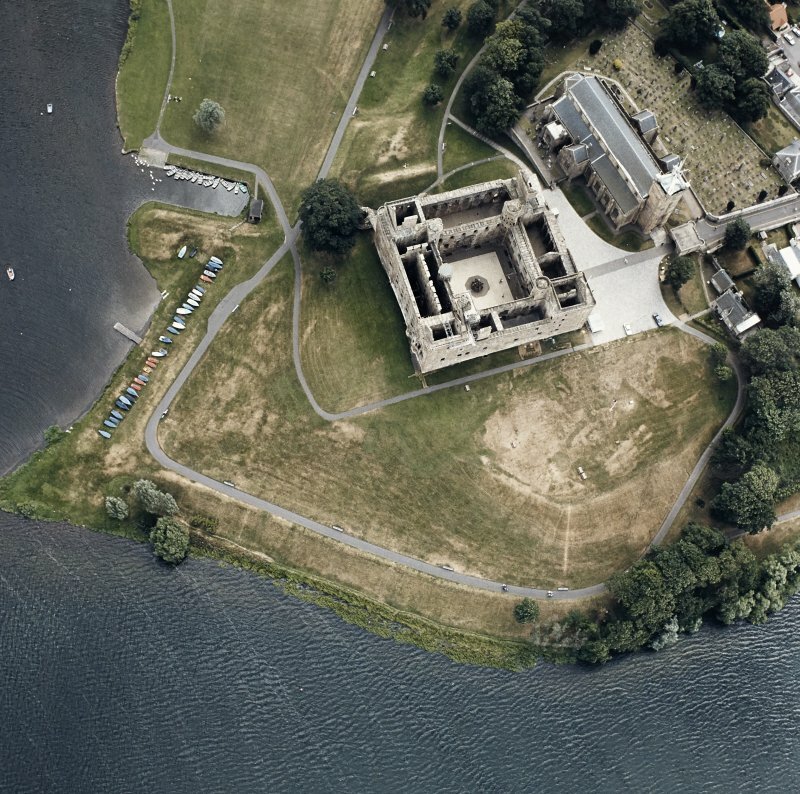 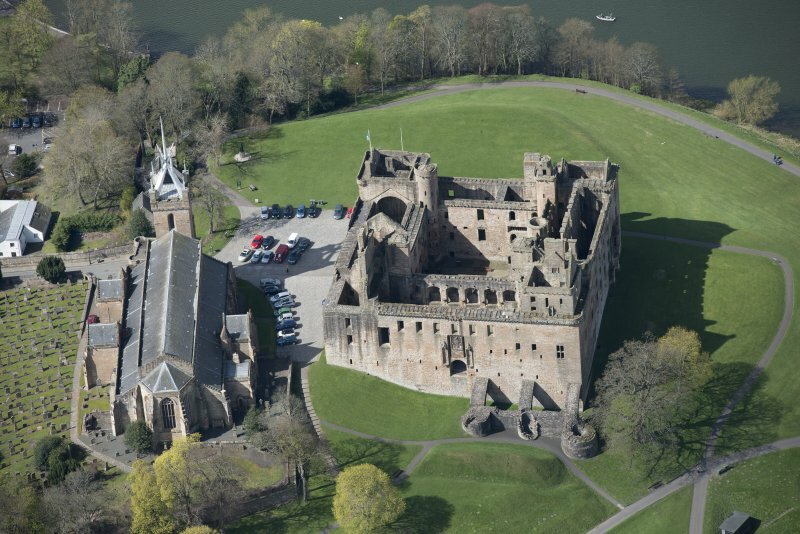 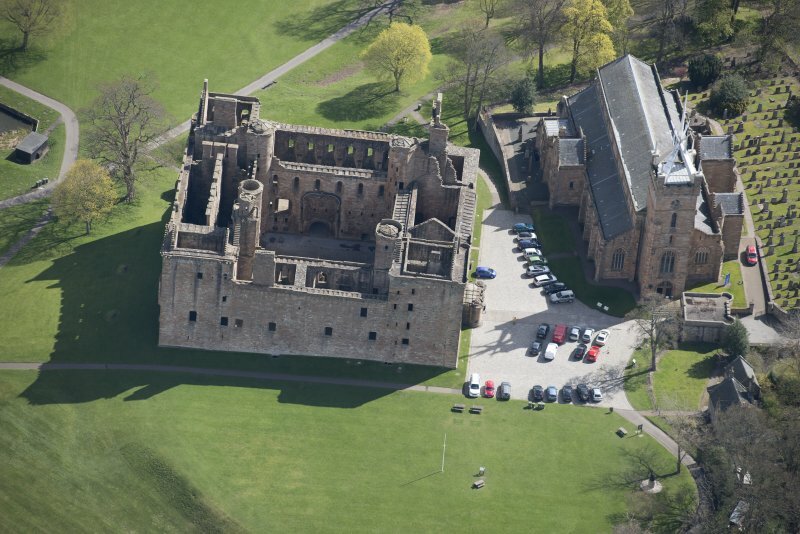 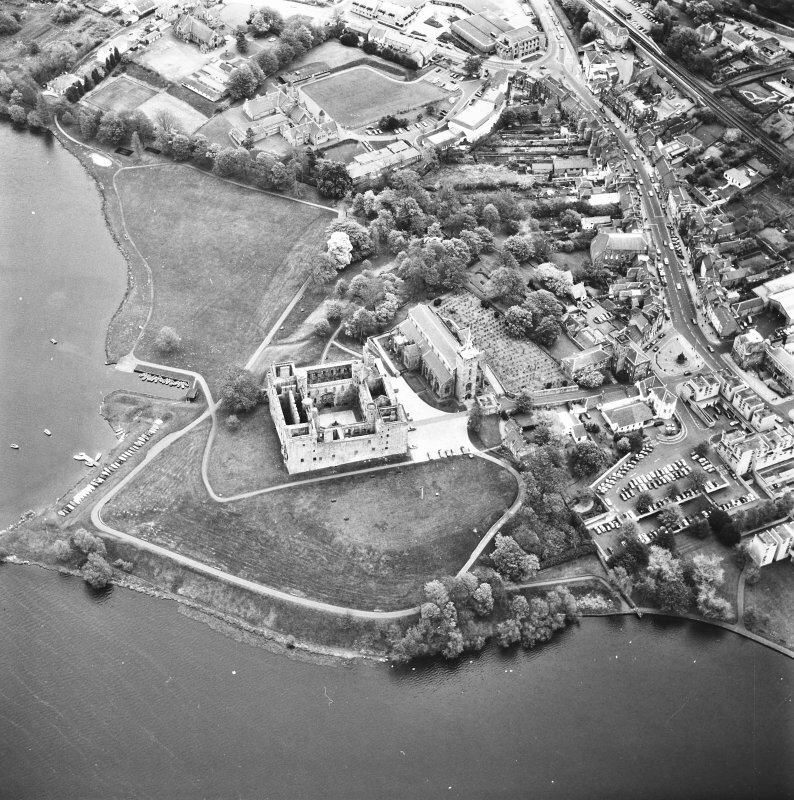 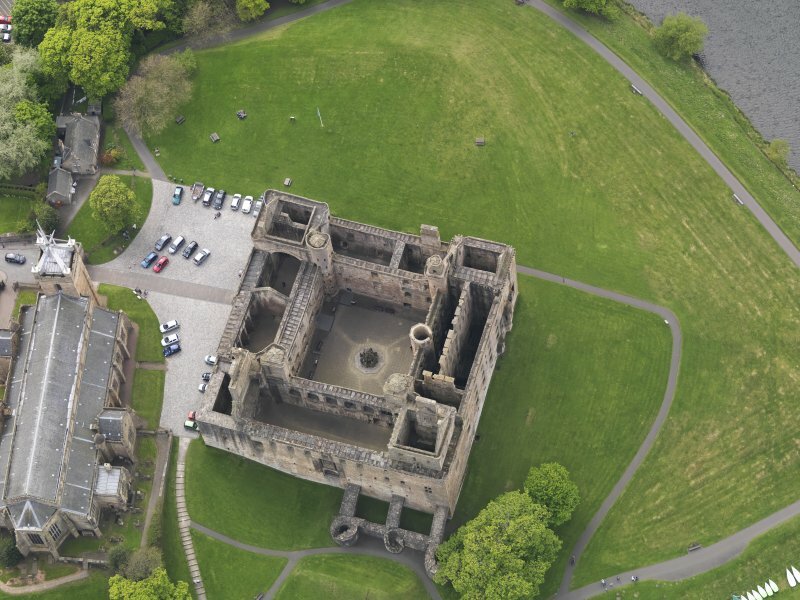 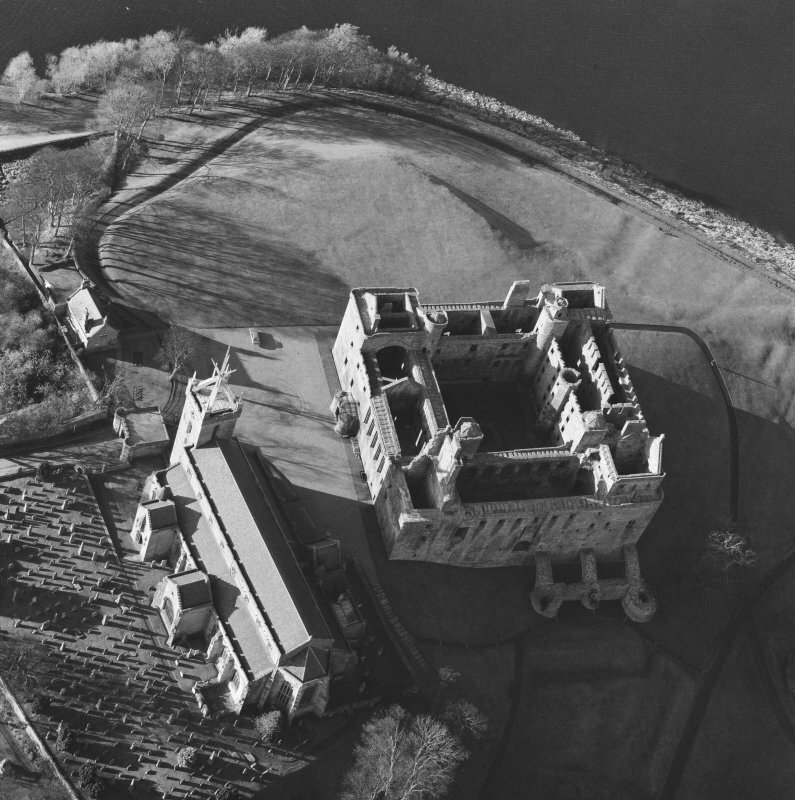 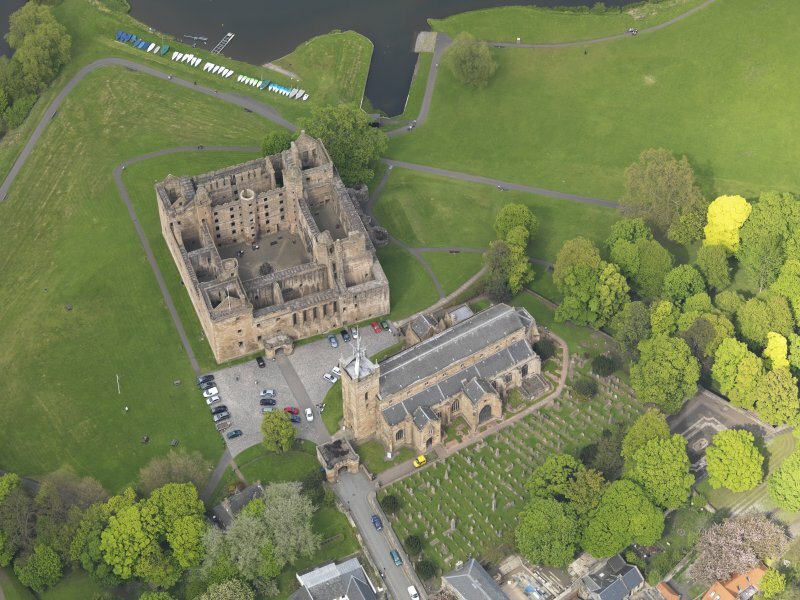 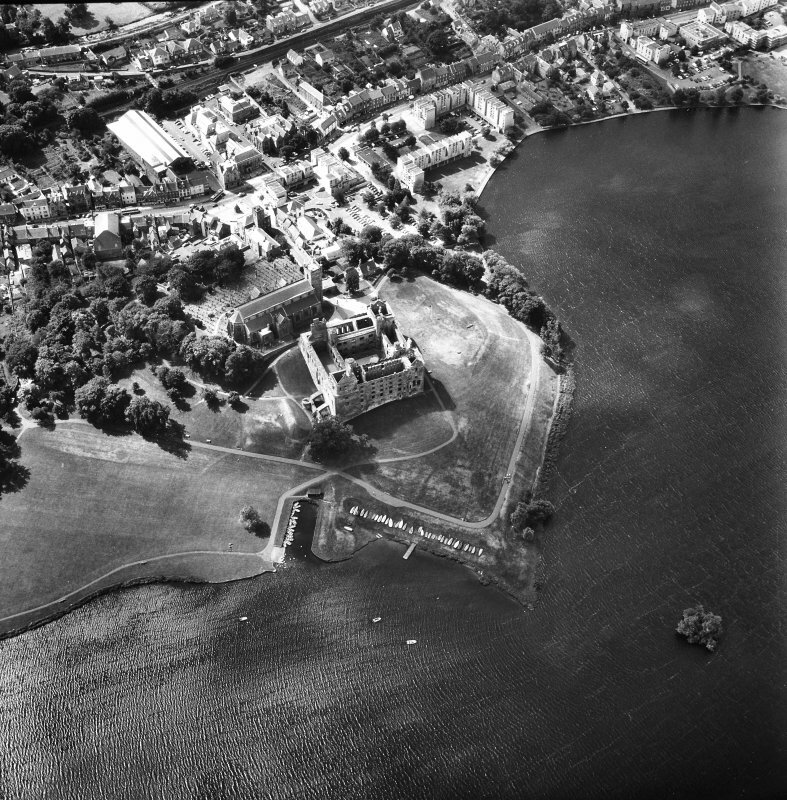 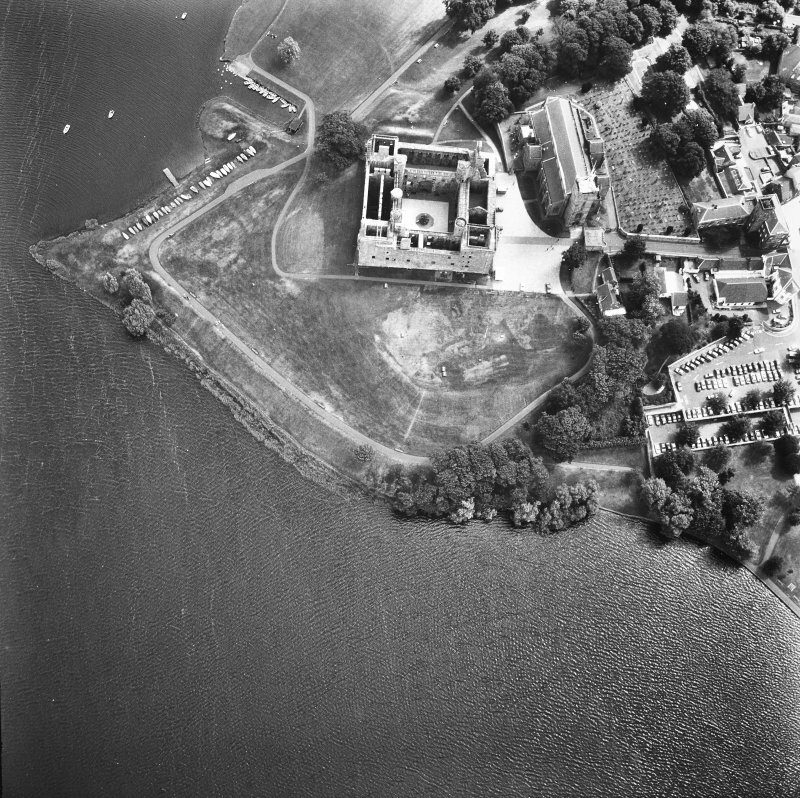 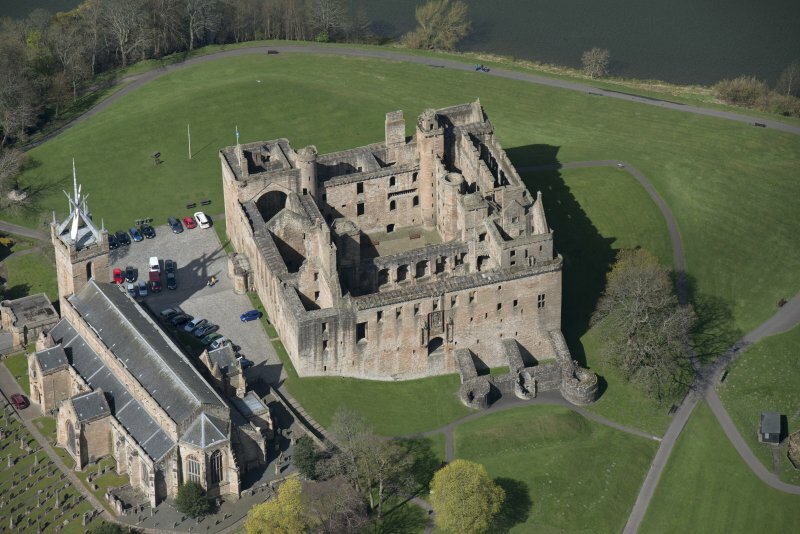 Oblique aerial view of Linlithgow Palace, taken from the SW.
Oblique aerial view centred on the Palace with the parish church adjacent, taken from the S.
Oblique aerial view centred on the Palace with the parish church adjacent, taken from the NNE. 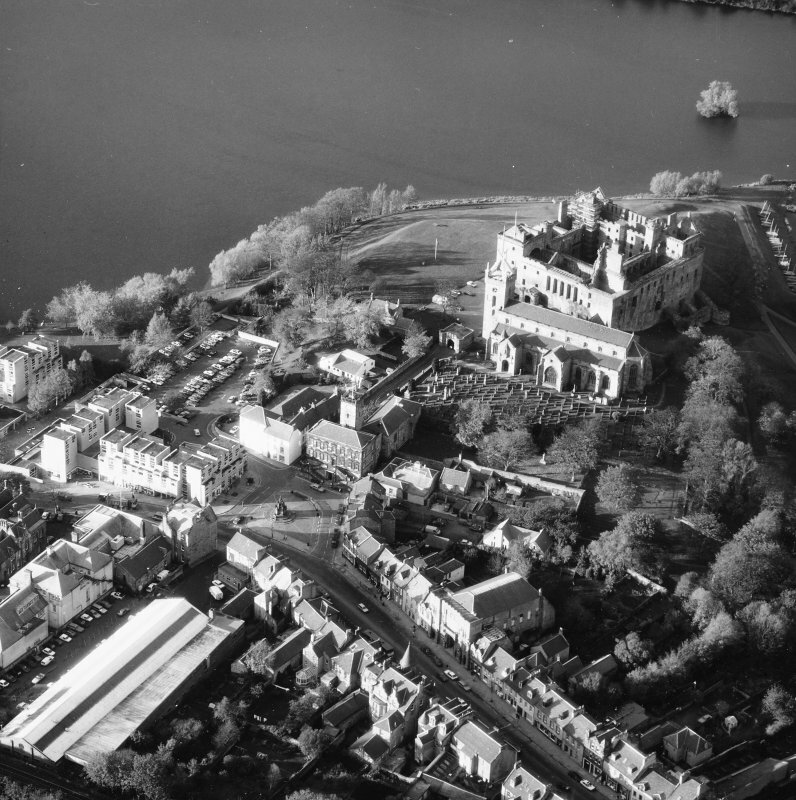 Oblique aerial view centred on the Palace with the parish church adjacent, taken from the E.
Oblique aerial view centred on the Palace with the parish church adjacent, taken from the SW.
General oblique aerial view of the palace, taken from the SW.
General oblique aerial view centred on the town, taken from the W.
Perhaps the finest parish church in Scotland, first dedicated by David de Burnham, Bishop of St Andrews, in 1242. 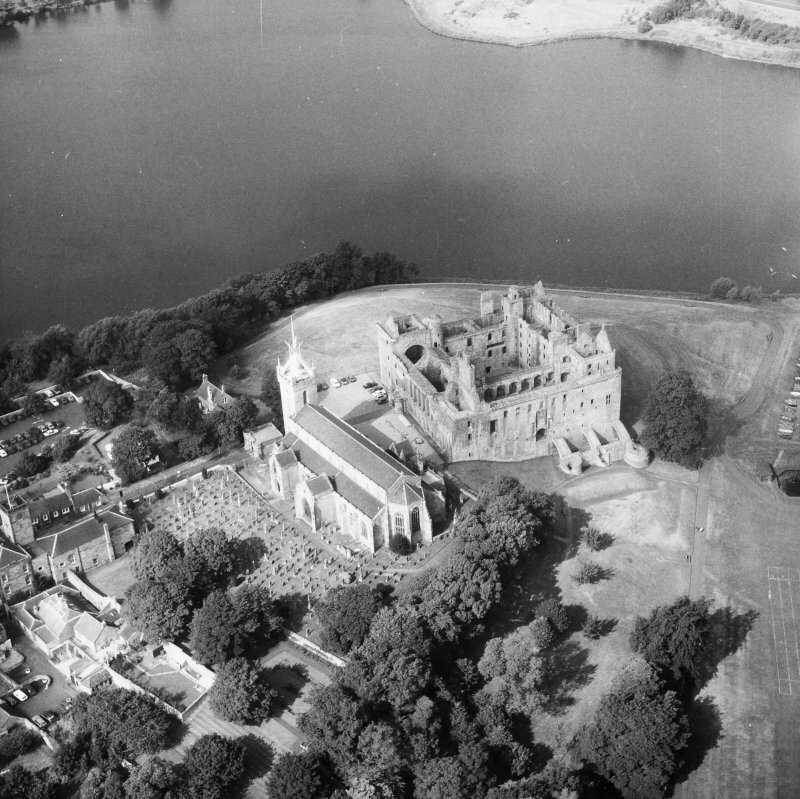 John Frenssh, and his son Thomas, undertook the rebuilding after a fire in 1424 and work was still continuing to the chancel and parapet in the 1530s. 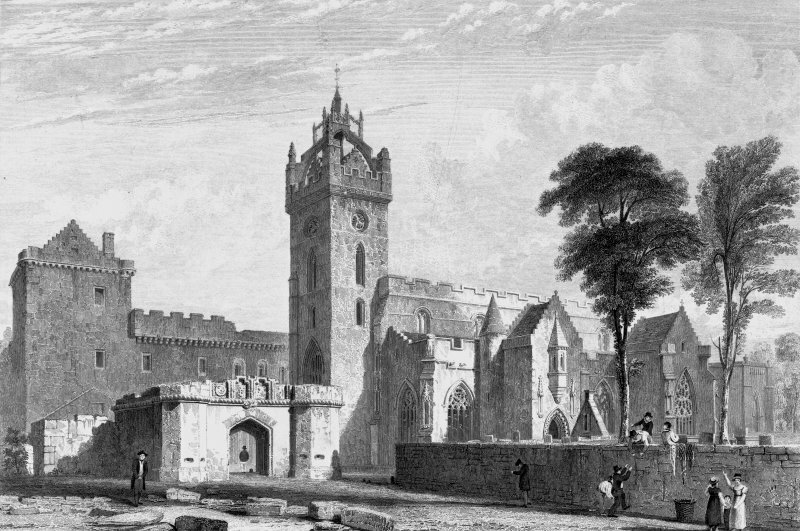 Cleansed by the Lords of the Congregation, 1559, it was equipped with new galleries for town magistrates, significant merchants, and the monarch. 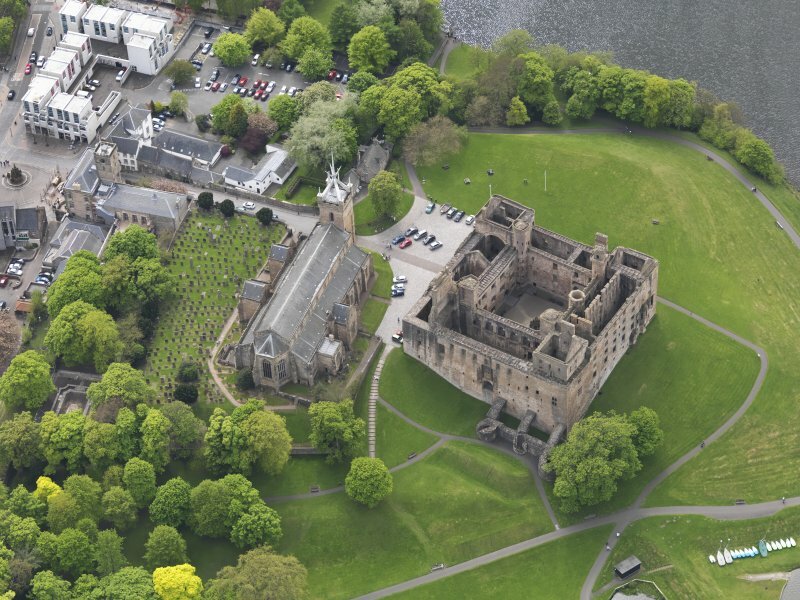 In 1606 and 1608, it acted as host to the General Assembly of the Church of Scotland. 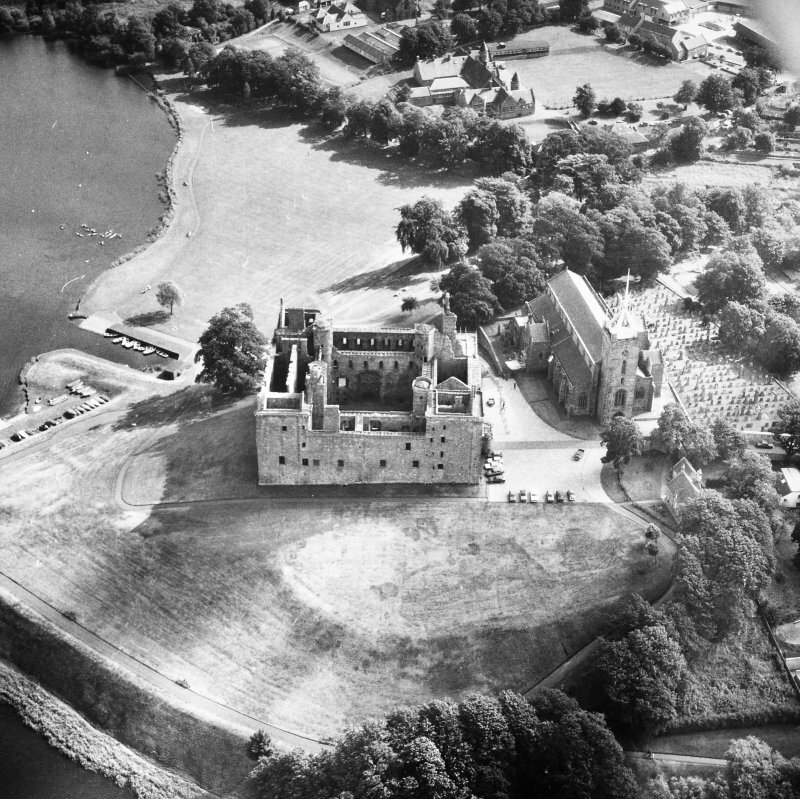 In 1638, one of the national covenants was signed within. 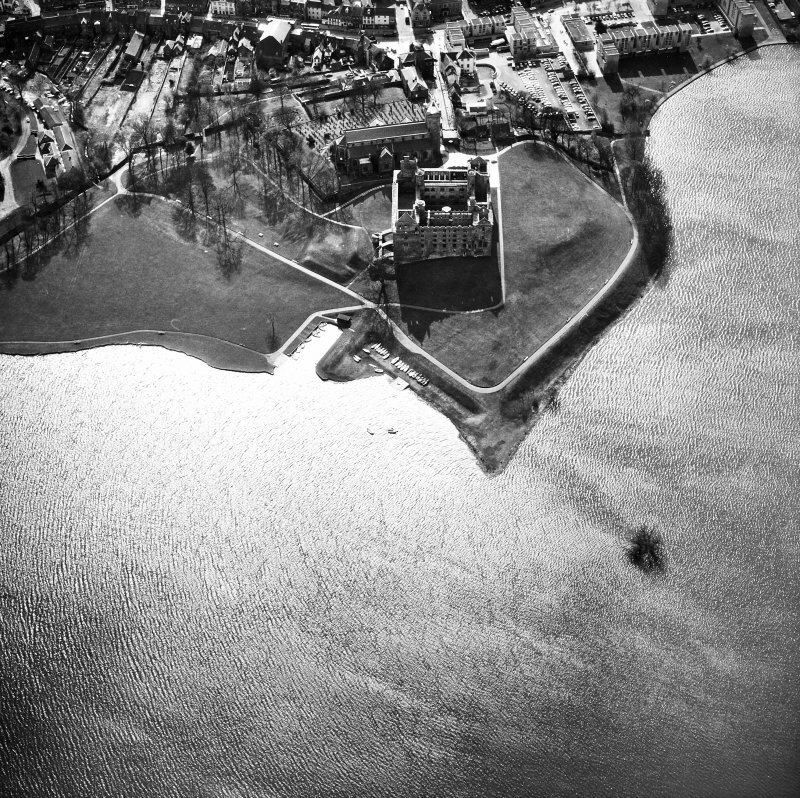 It decayed during the 18th century, making it vulnerable to restorations in the 19th. 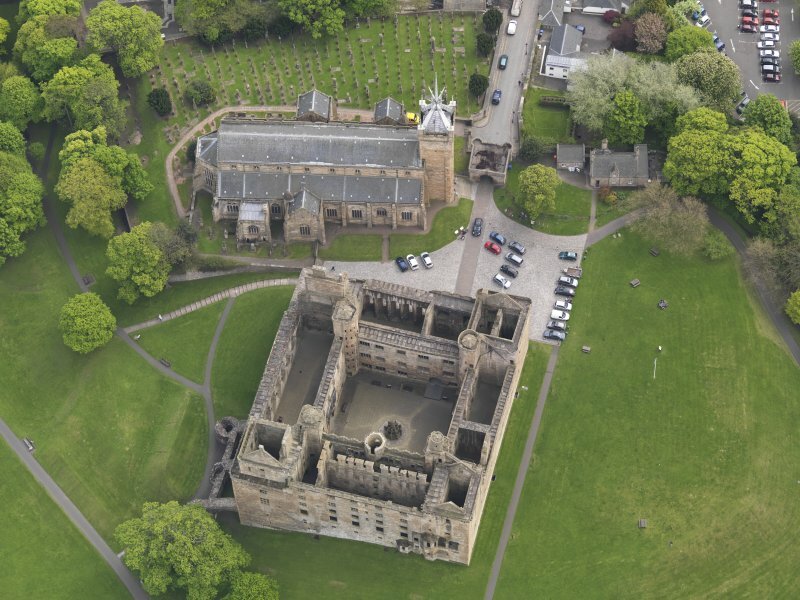 In 1812, James Gillespie Graham demolished the chancel arch, erected galleries in the chancel, a solid wall across the choir, and replaced the medieval timber roof with fake-masonry plaster vaults. 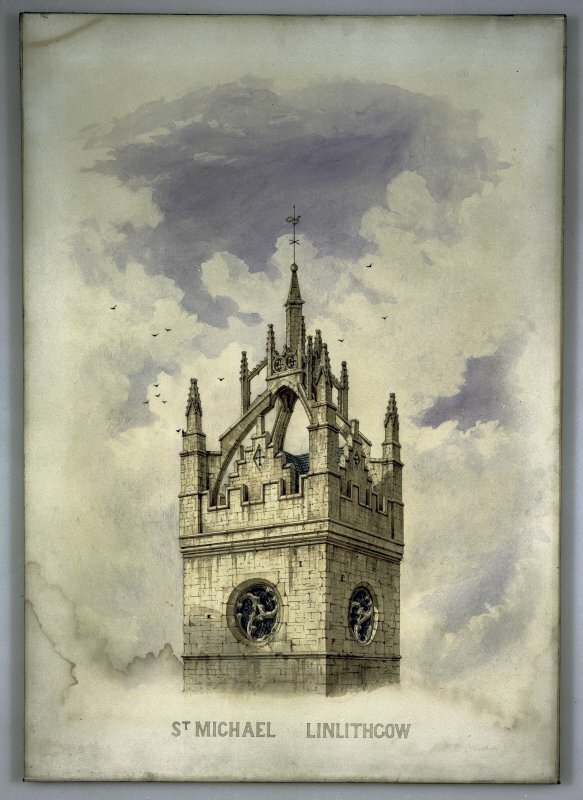 In 1821, the superb crown steeple was removed because of threatened collapse. 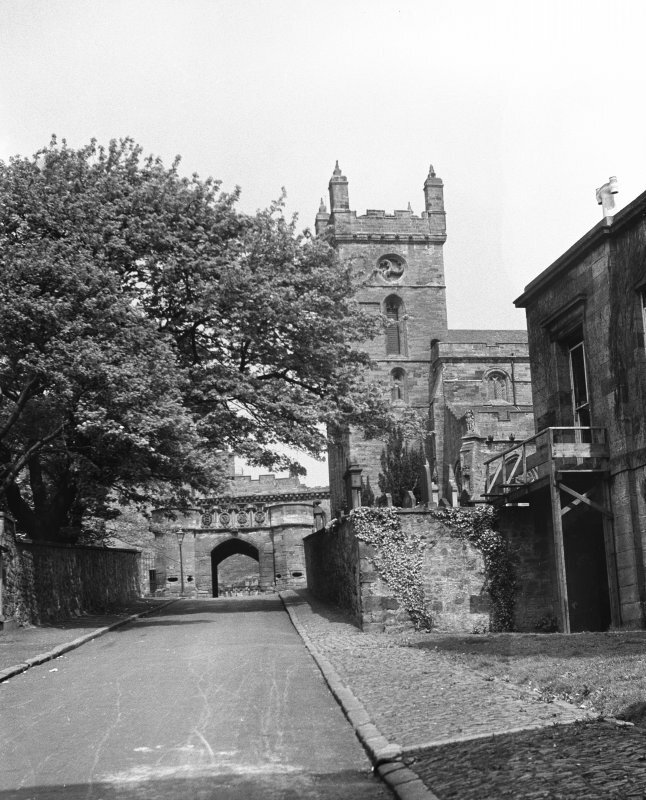 In 1894 and 1896, Honeyman & Keppie sensitively removed the galleries, rebuilt the chancel arch, and added the choir vestry on medieval foundations. 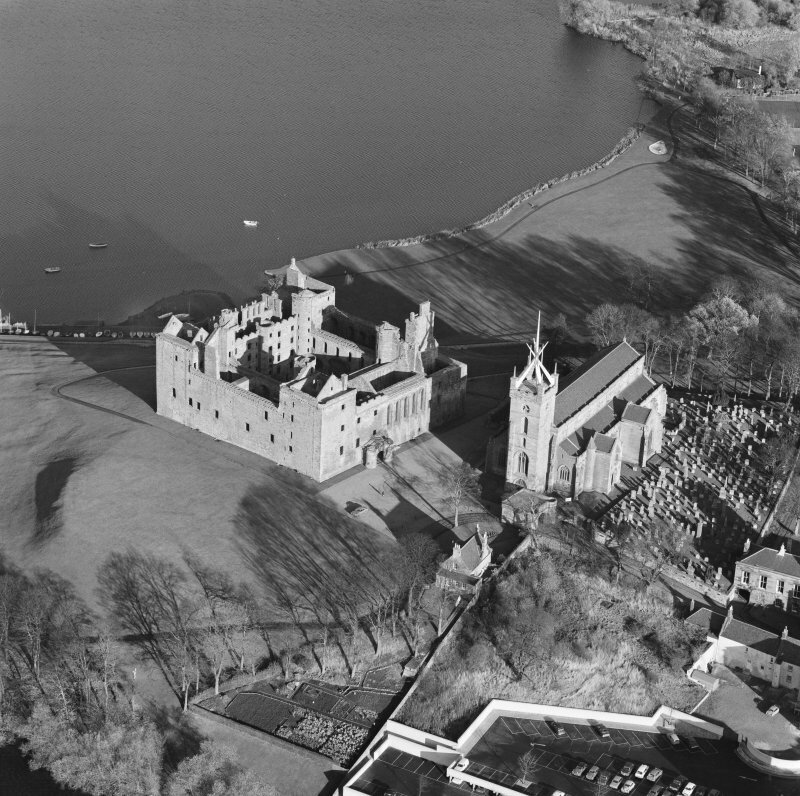 Without its crown steeple, the tower looked strangely truncated and, in 1964, Geoffrey Clarke's lightweight, laminated, spiky, timber crown, covered in gold anodised aluminium, was consecrated. 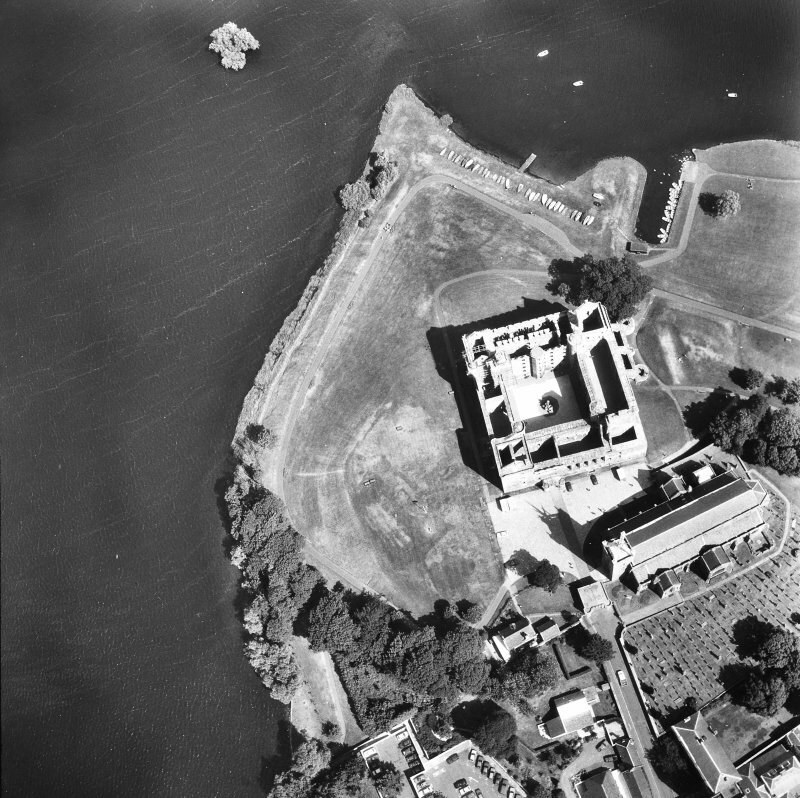 The design of the new crown derived from the skills, techniques and economics of the 1960s. 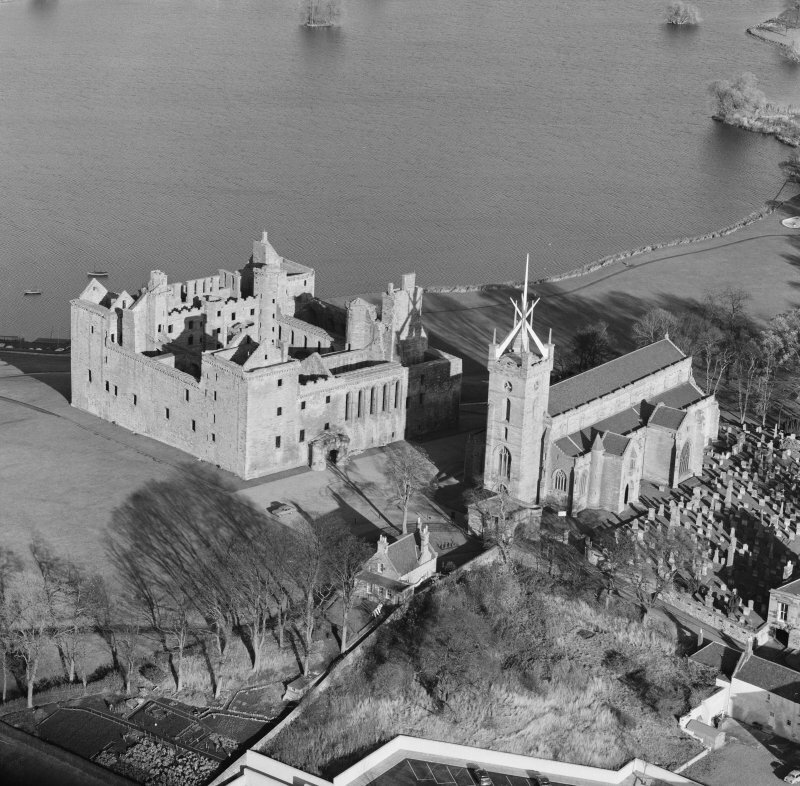 It would form the latest of many additions to the new church, and should be in the same bold spirit as those additions which reflect the time in which they are made. 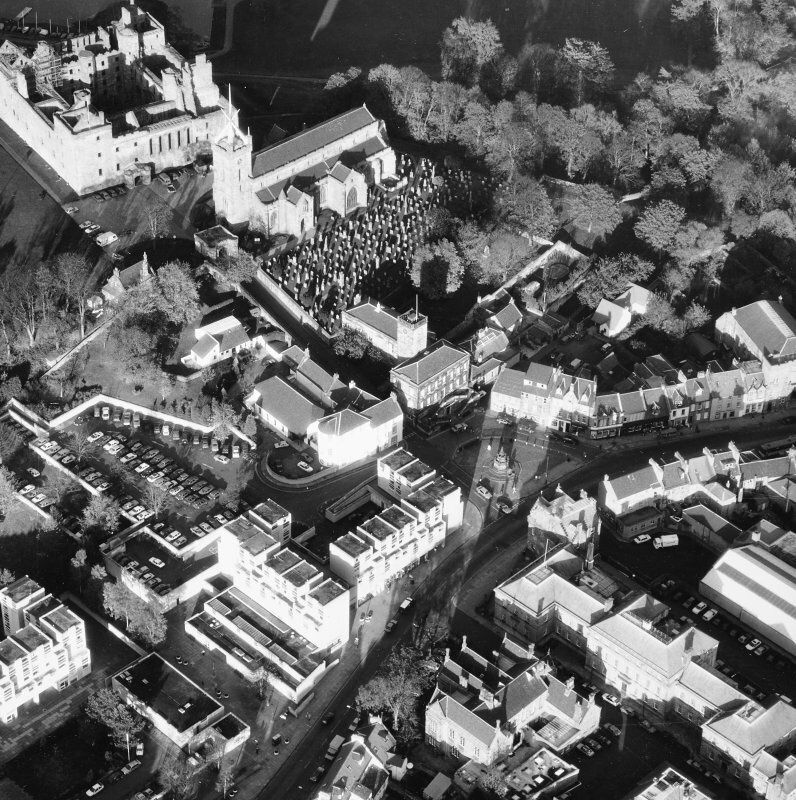 This approach would demonstrate a living church and a living community. 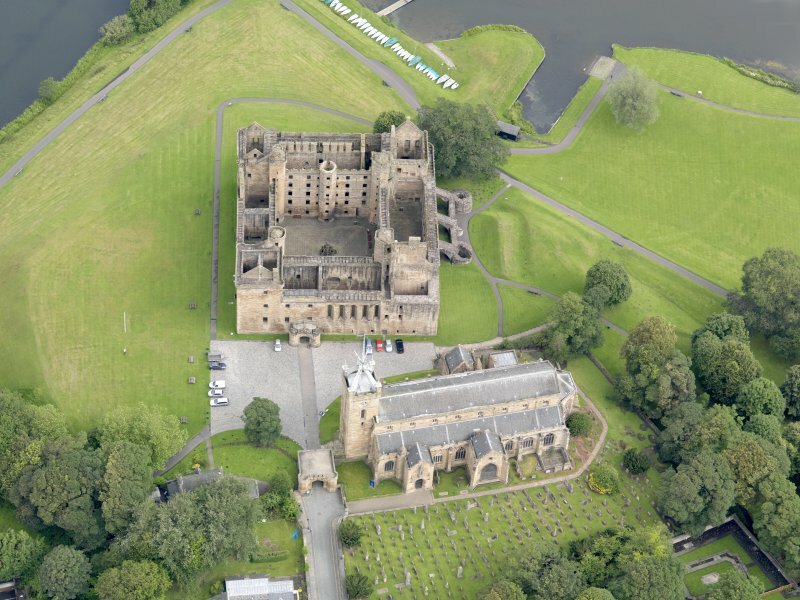 The church comprises nave, transepts, choir and apse, the tower situated ' as in Stirling, Dundee and St Andrews ' at the west end, and not over the crossing. 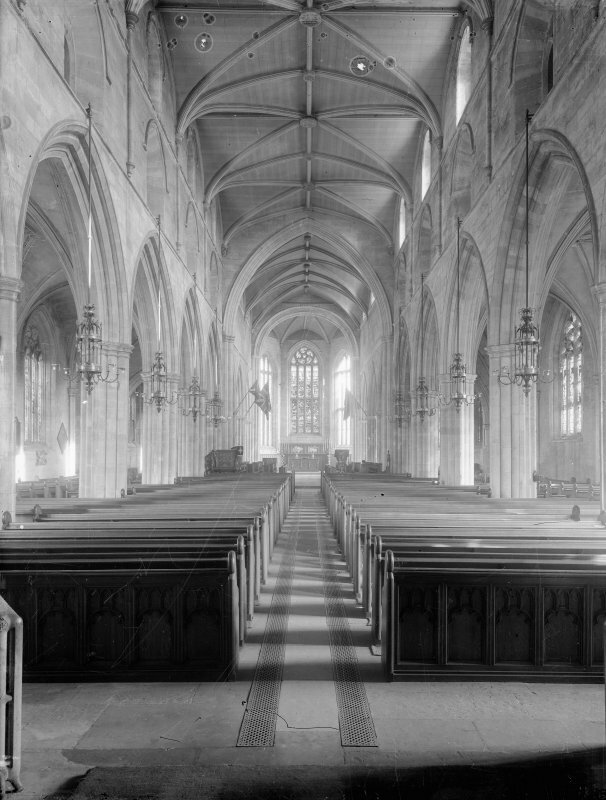 Unusually luminous interior lit by its array of triforium and clerestory windows, and glowing with the huge Perpendicular windows of the apse, is broad and spacious. 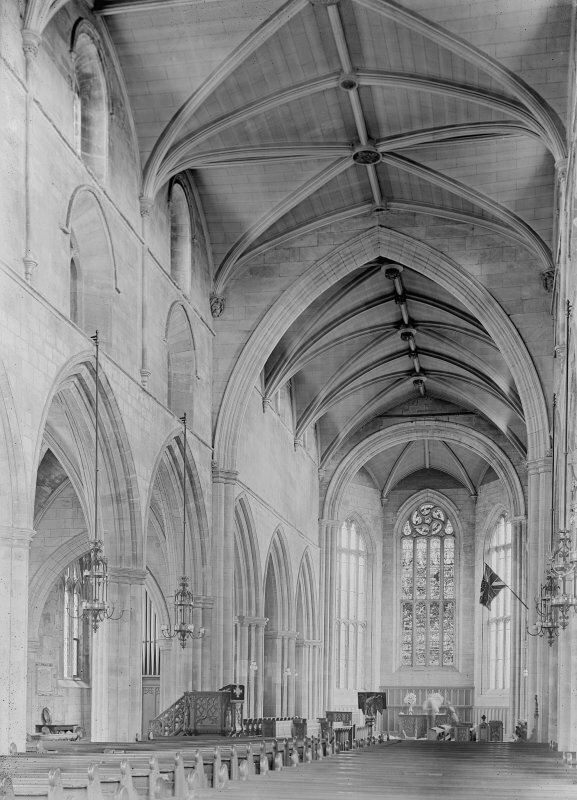 A commanding geometric hand has been at work: like a miniature cathedral, the aisles are half the width of the nave and chancel, both nave and chancel are just short of being square. 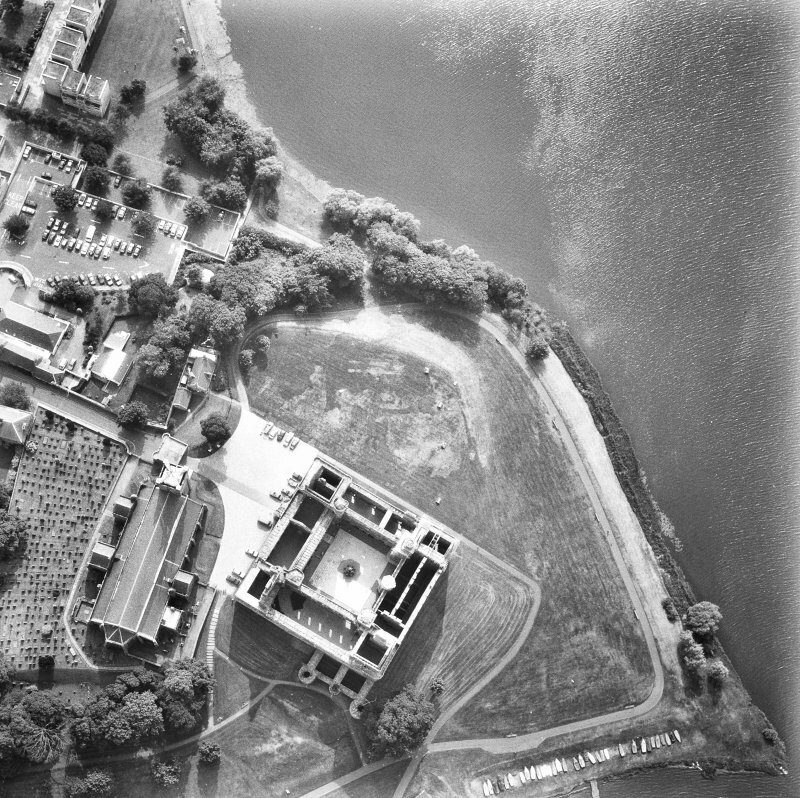 Transept and belltower are both virtually square. 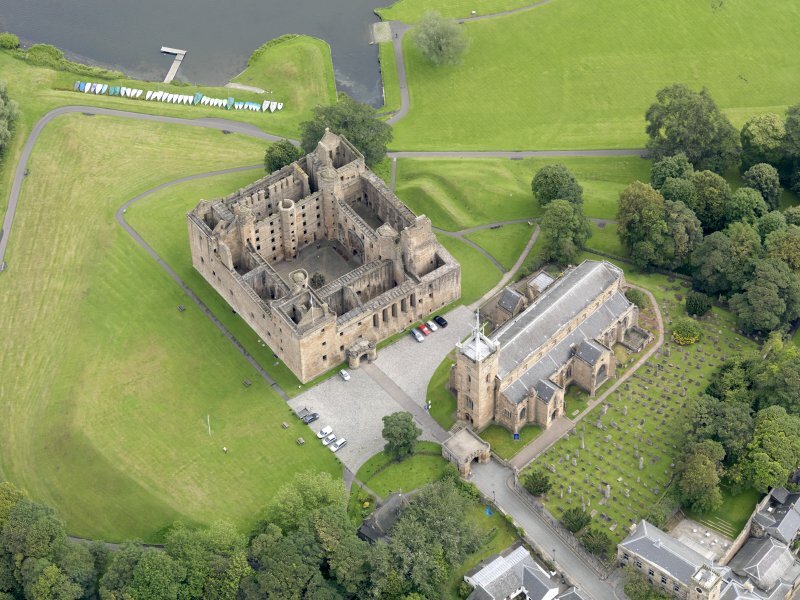 Nave and aisles are continuous, like a vast ship, with a semi-octagonal apse for a prow, entrance tower as poop: the effect enhanced by the way that the beautiful south entrance porch and the two transepts stand proud of the body of the kirk, roofed and gabled, as the aisle roof runs behind. 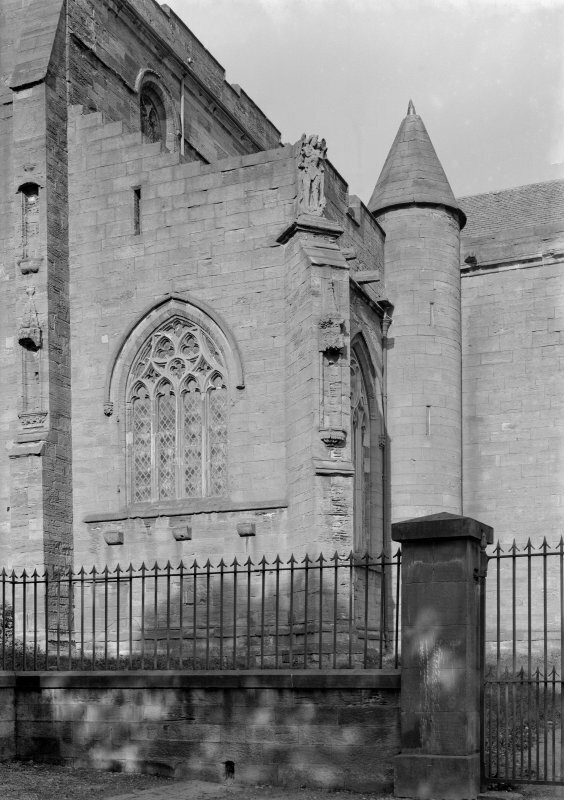 The homogeneity is more apparent than real: look at the elegant south parapet to the choir, probably the work of Thomas Frenssh. 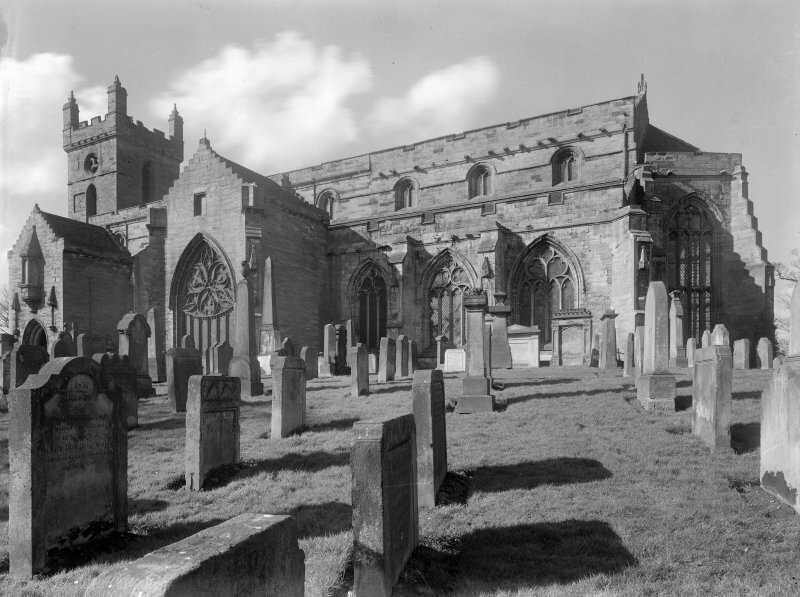 The rib-vaulted south porch is a gem, niches flanking the entrance, oriel window above lighting the priest's room reached by a circular tower in the re-entrant The south wall of the south transept, or St Katherine's Aisle ' a plain, square, mystical vaulted space ' is almost entirely glass; swirling Scots tracery and stained glass depicting the Pentecost by Crerar McCartney. 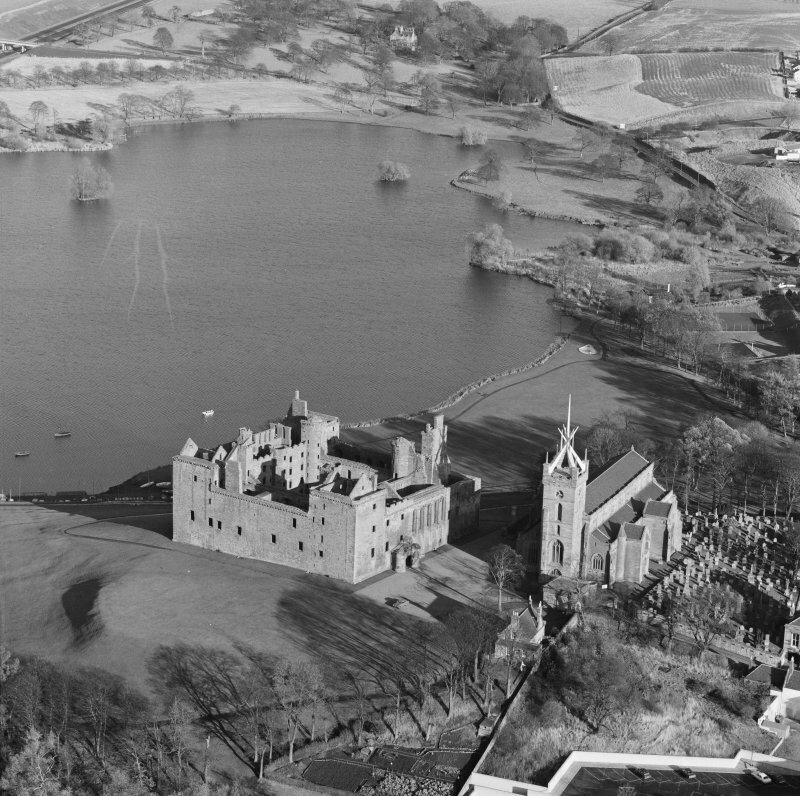 The effect is absolutely stunning. 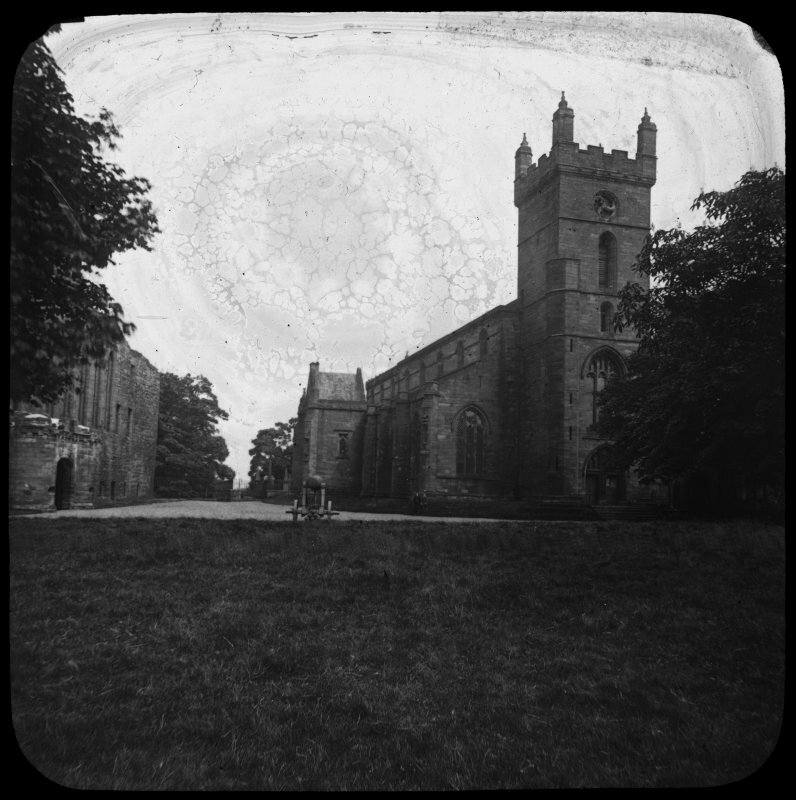 It is a huge, curved-sided, equilateral triangle containing cusped circles and daggers within, sitting upon six cusped columns. 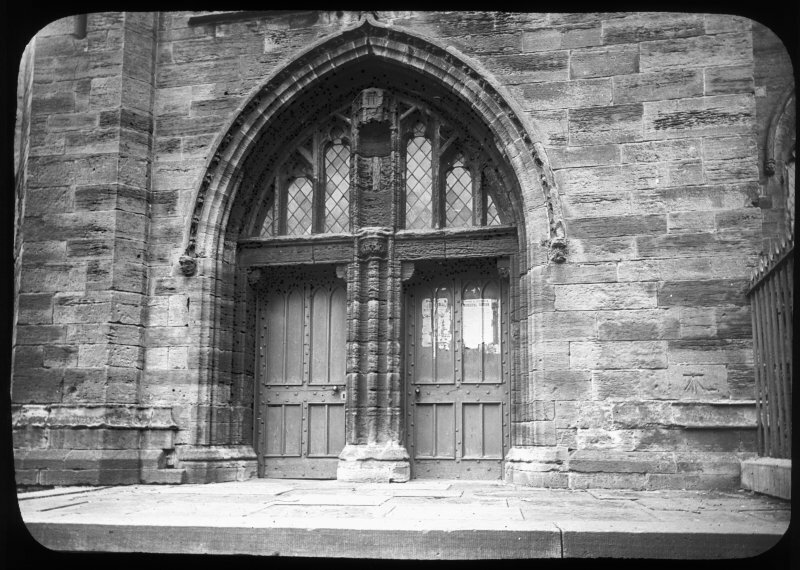 The west door, divided by a trumeau (French-style) like Haddington, St Giles and Dundee, is grossly under-appreciated. 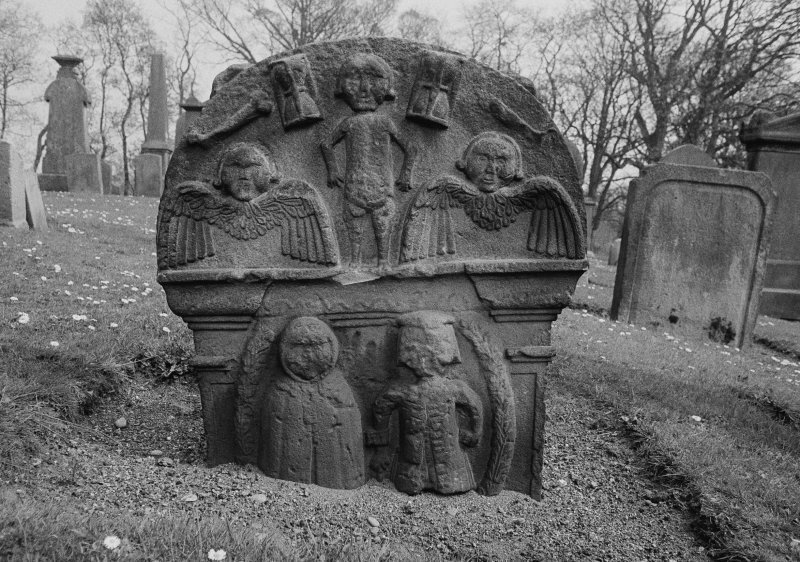 St Michael the Archangel on the south-west buttress was the only statue to vanquish the Cromwellian dragons. 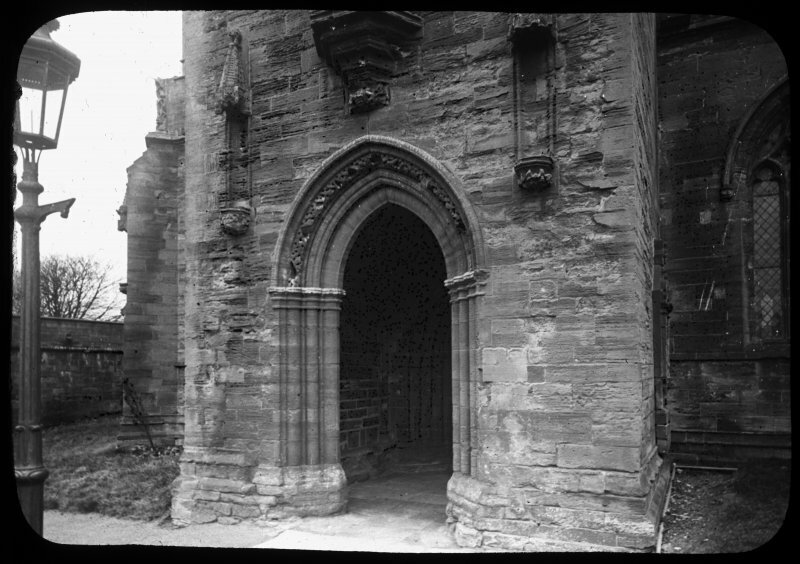 Internal oak screen to the Queen's Aisle by William A Cadell, 1985. 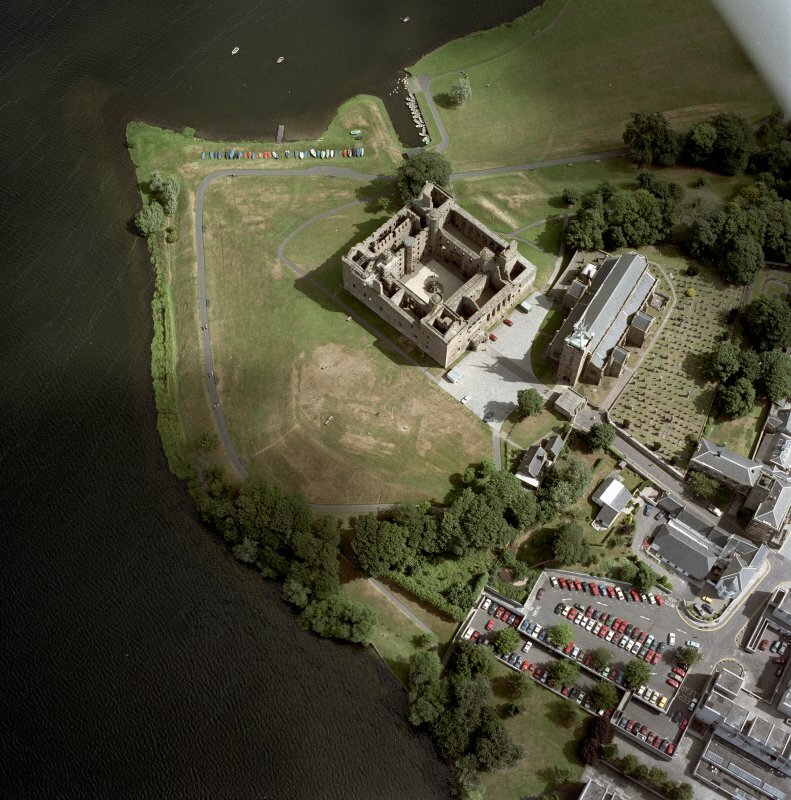 External restoration and neat internal toilet 'pod' by The Pollock Hammond Partnership, 2000 and 2003. 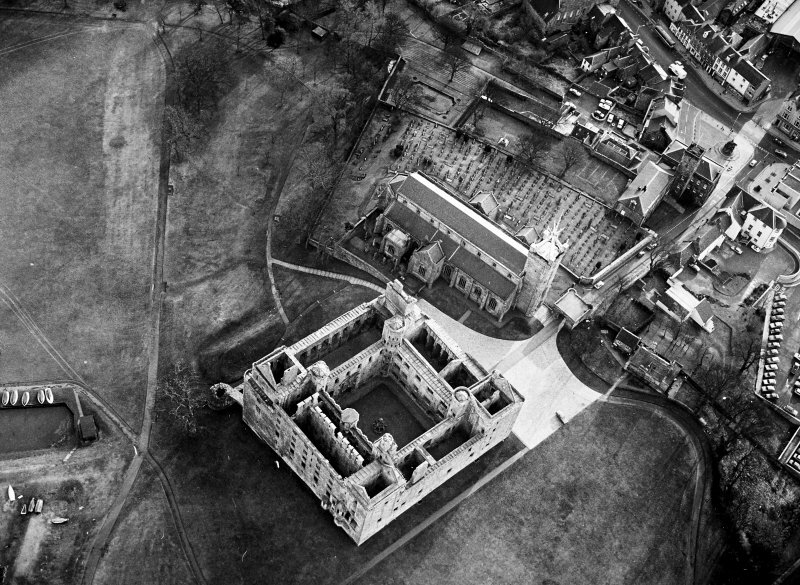 Twelve consecration crosses elegantly incised in a circle, possibly dating back to 1242, three aumbries (cupboards), a piscina, a window by Burne-Jones, the blocked royal door in the north side leading to the palace, the ornate Gothic timber pulpit by John Honeyman. 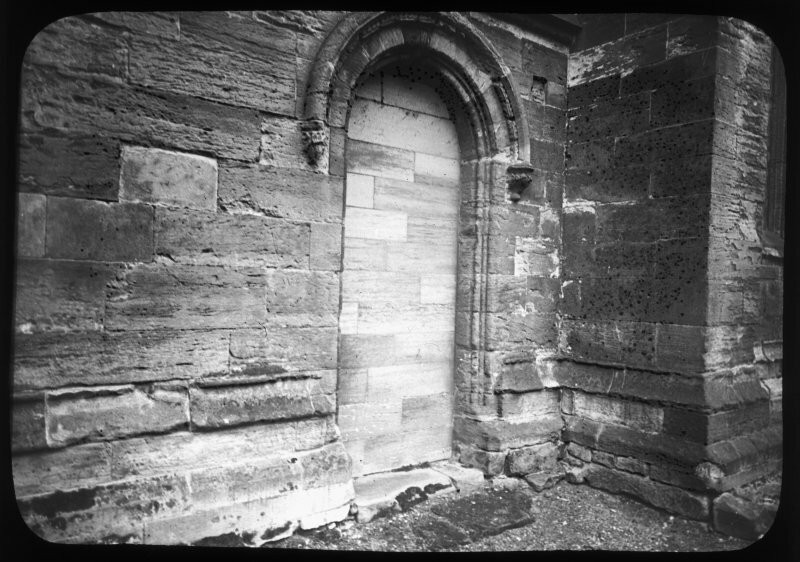 In the atmospheric but very regimented kirkyard, note the Livingston Burial Vault, 1668, with its mort-safe. 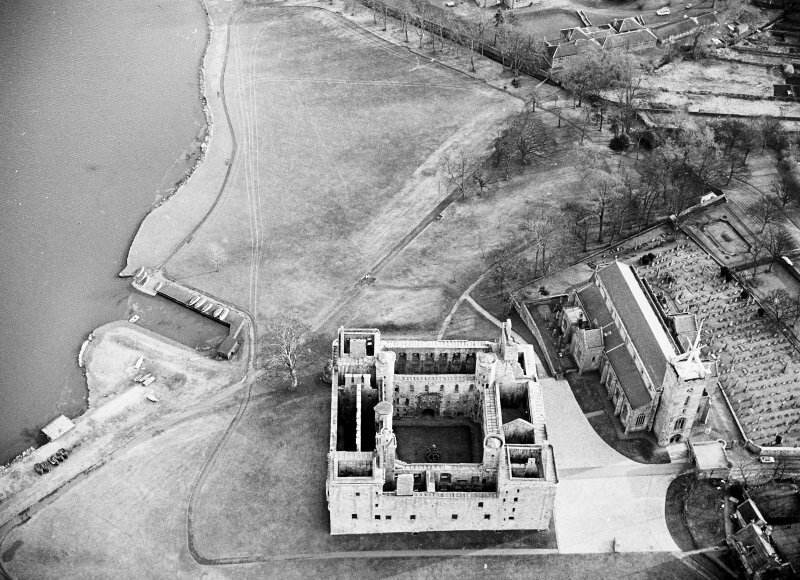 St Michael's Manse & Church Hall, 1974 and 1988, William A Cadell, form a neat group in crisp white harl and grey-slated monopitch roofs. 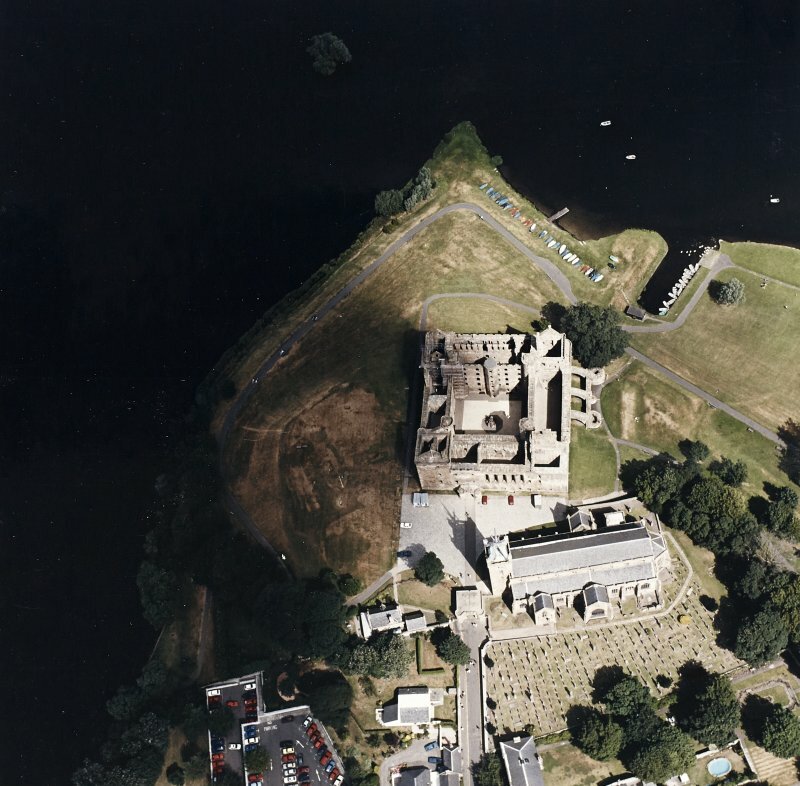 Manse extended, 2004, by Pollock Hammond Partnership. 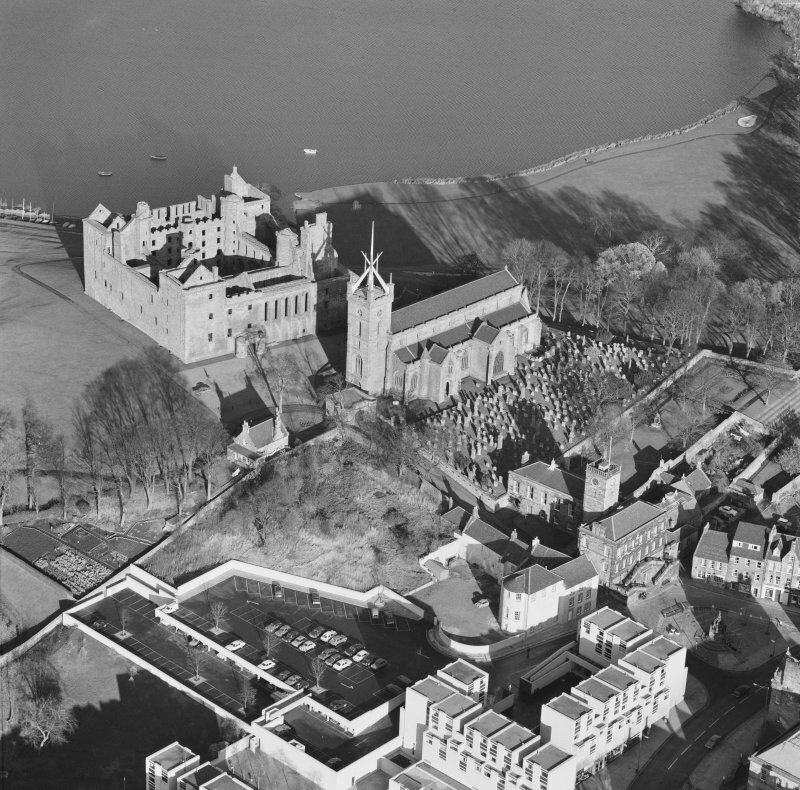 (NT 0023 7728) Linlithgow parish church, dedicated to St Michael, dated from c.1425 - c.1530. 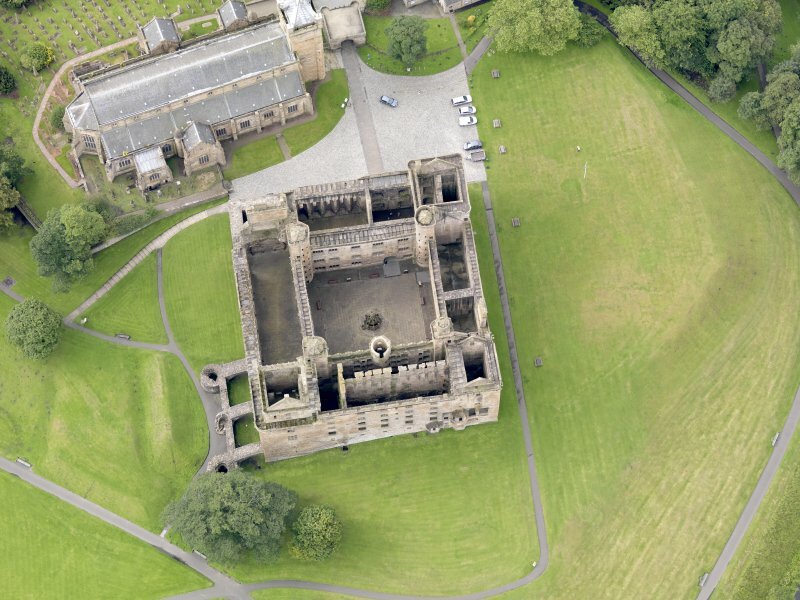 The nave is a re-building of the church partly destroyed by fire in 1424. 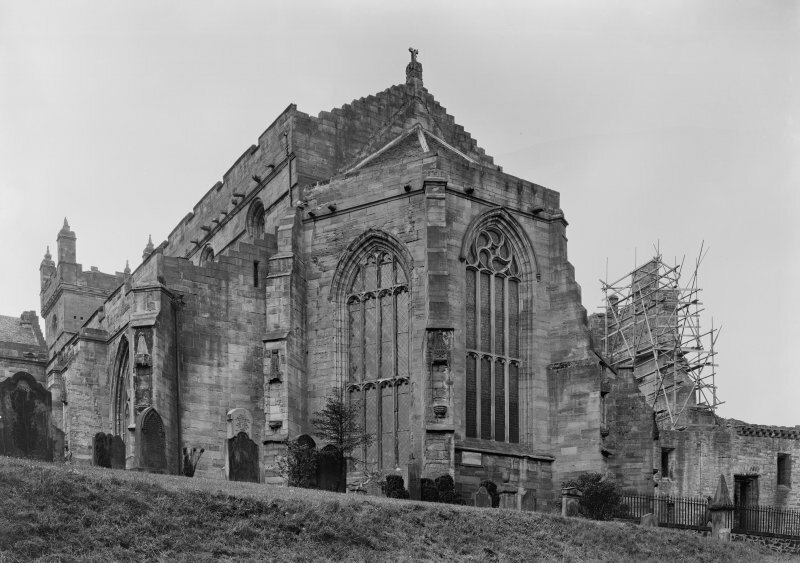 The chancel was built c.1494, a 3-sided apse being added c.1530. 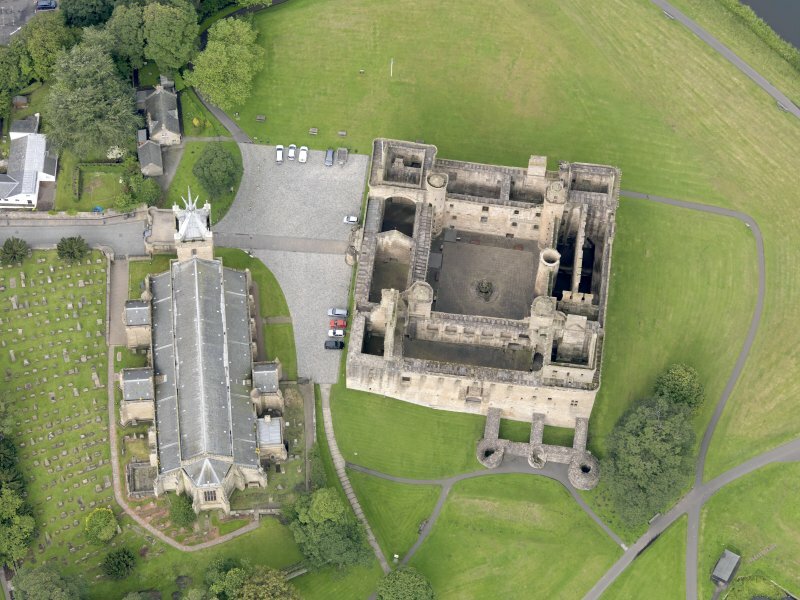 All the figures, save that of St Michael, were destroyed by the Lords of the Congregation in 1559. 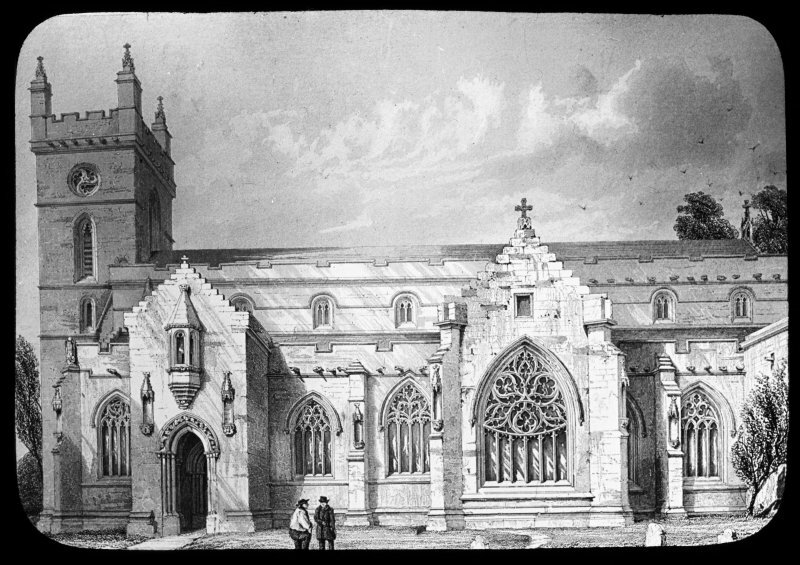 The church was repaired in 1812, and restored in 1894-6, the vestry being added at that time on the site of the sacristy. 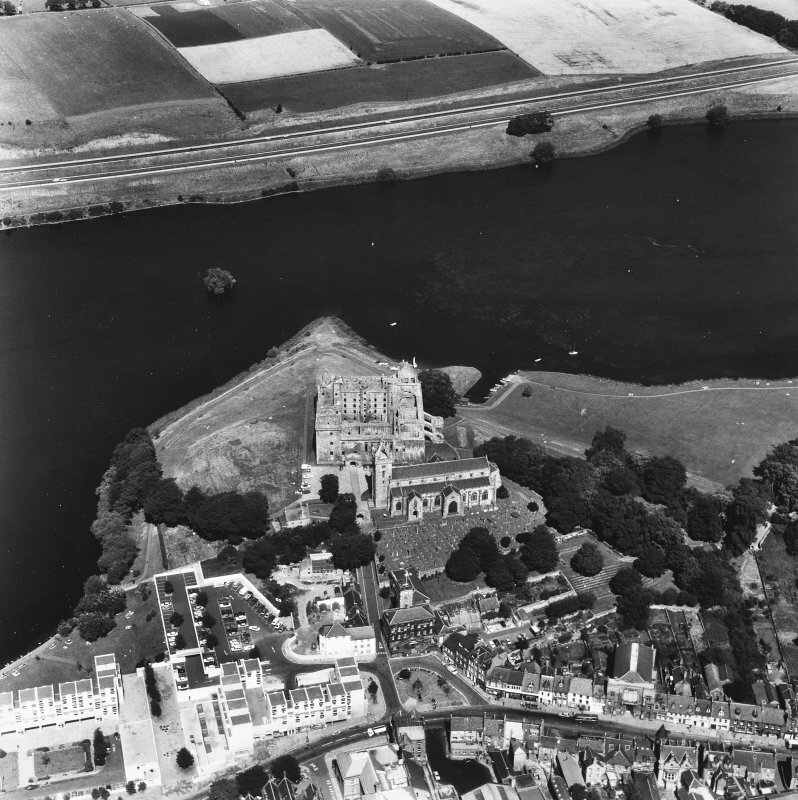 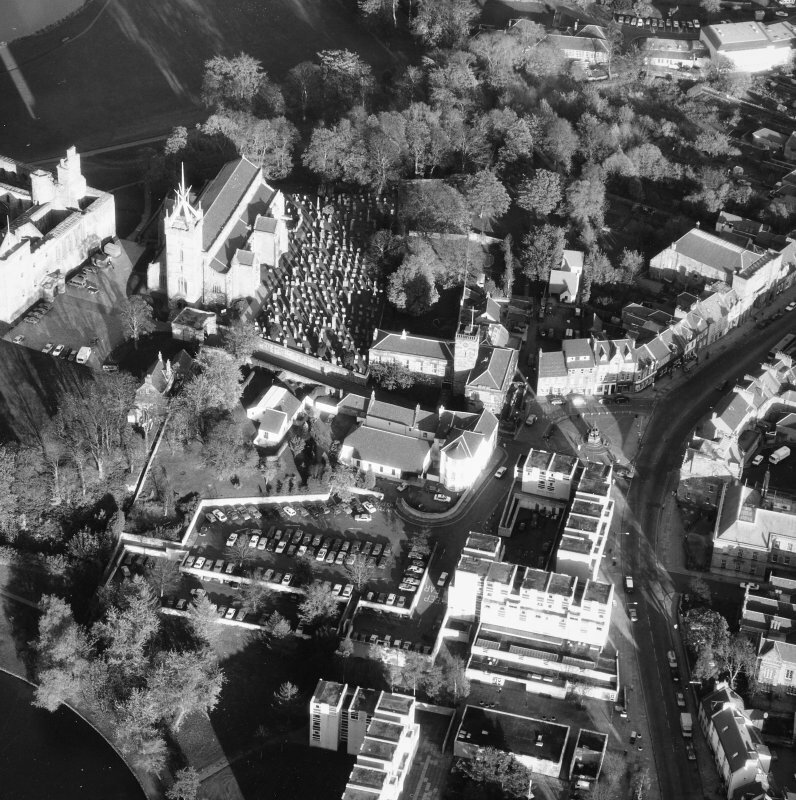 The Church and surrounding buildings are visible on vertical air photograph (OS 73/399/296, flown 1973). 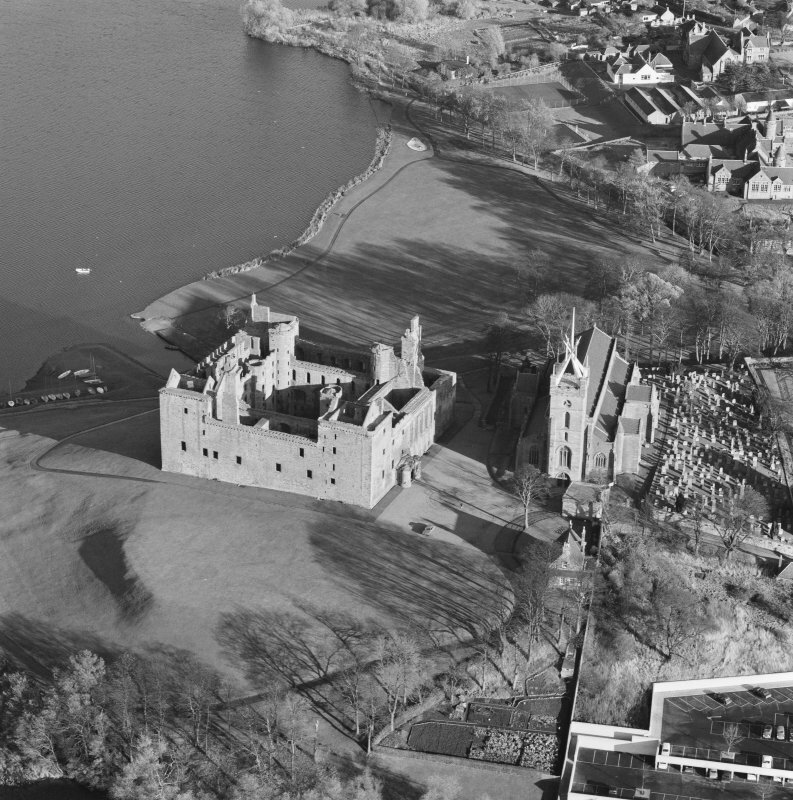 Information from RCAHMS (RJCM) April 1992. 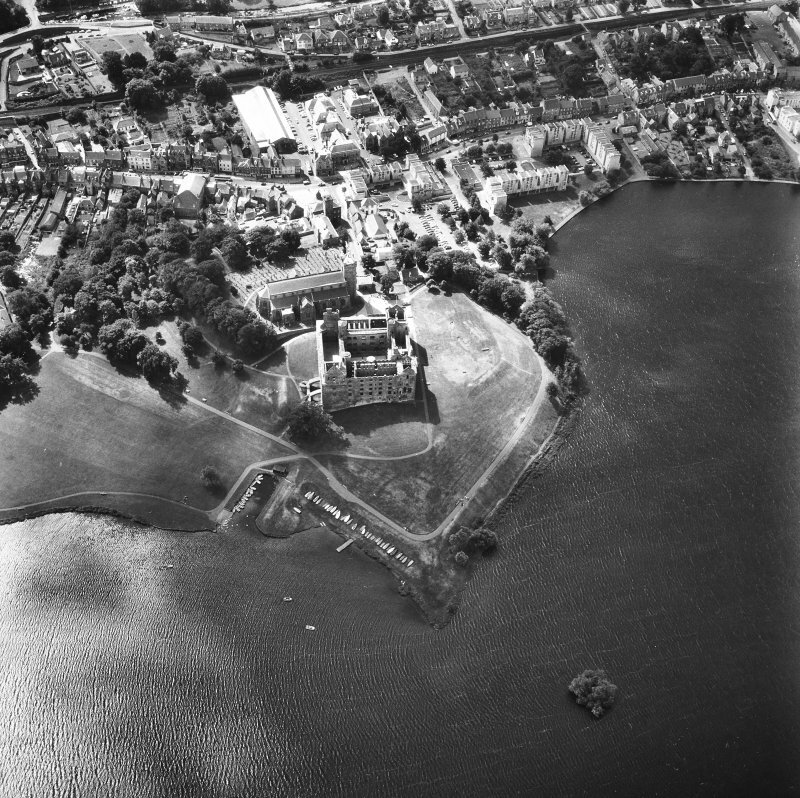 Non-Guardianship Sites Plan Collection, DC28203- DC28205, 1907. 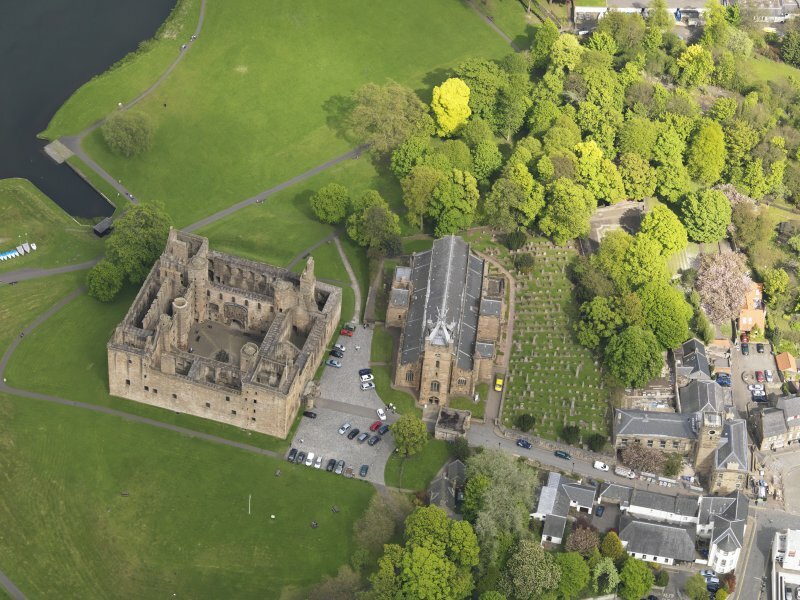 The church of Linlithgow, dedicated to St.Michael, was first mentioned in an 1138 charter granting it to the bishop of St.Andrews (Lawrie, 1905, 90). 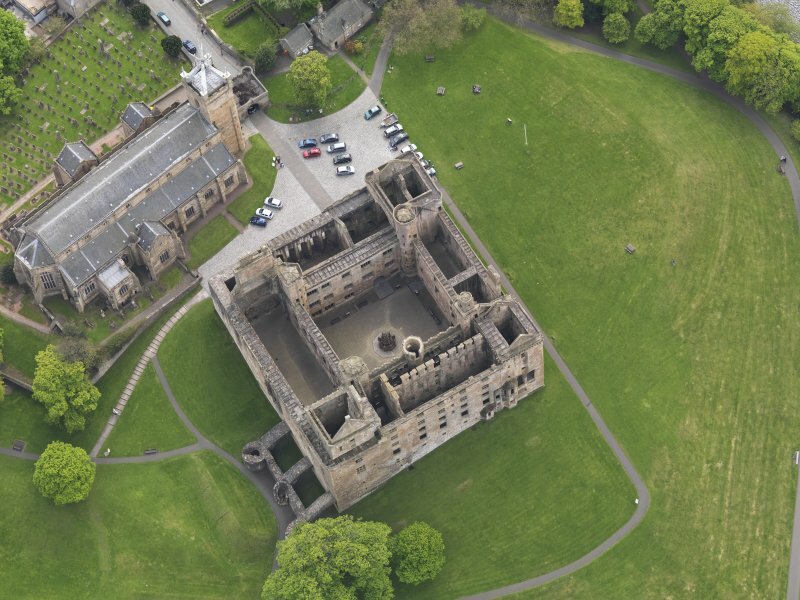 The nave of the church was burned in 1424 and repair and enlargement of the fabric continued through the fifteenth century. 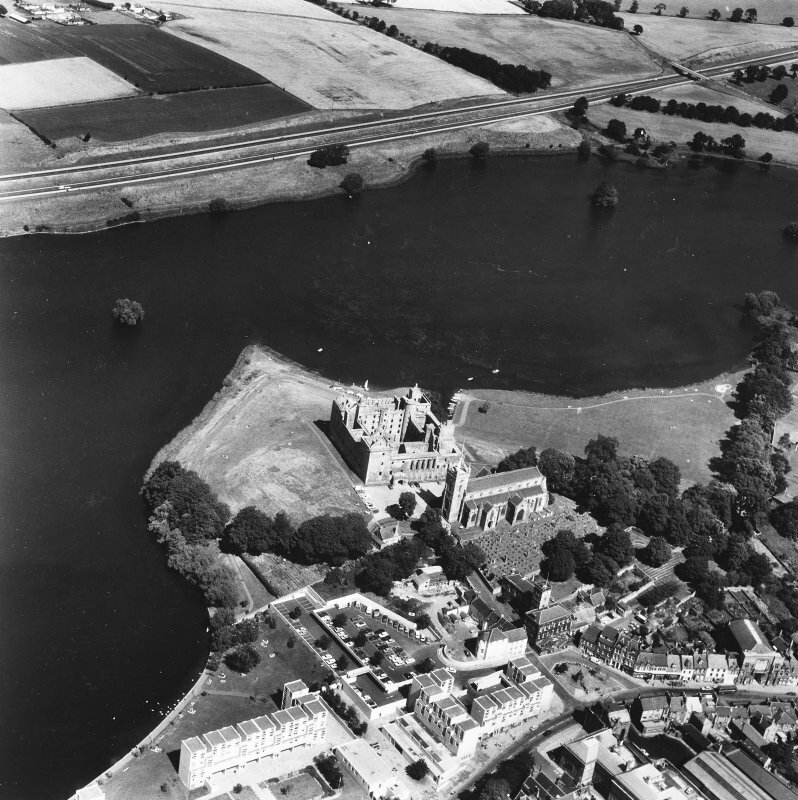 The church was completed about 1540, just in time to be 'cleansed' by the Lords of the Congregation in June 1559 (Powell, 1974, 13). 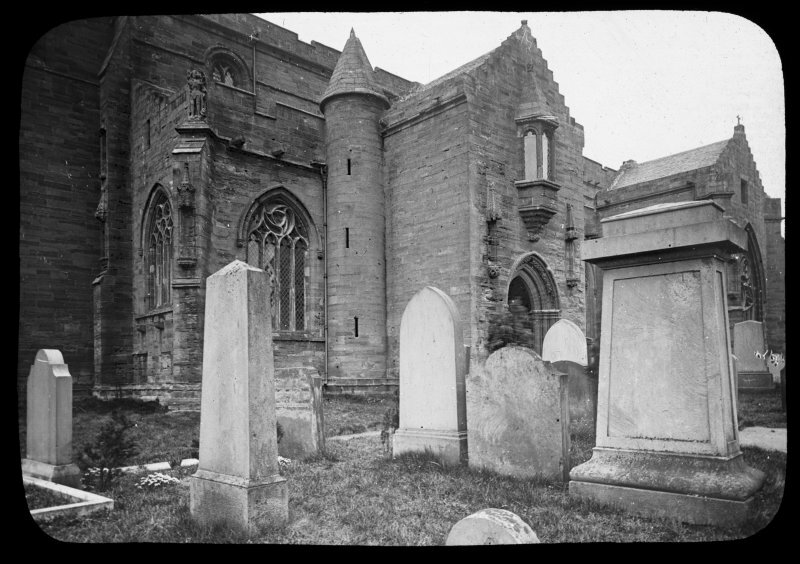 The church underwent repair in 1831 and was extensively overhauled in 1894-96. 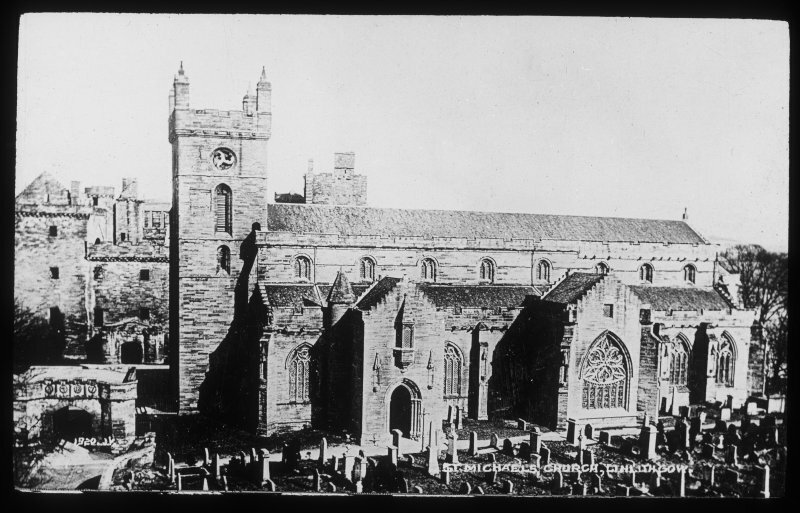 At this time a valiant attempt was made to repair as much as possible the damage that had been done in 1831 when the choir arch was removed and a screen wall erected one bay to the east. 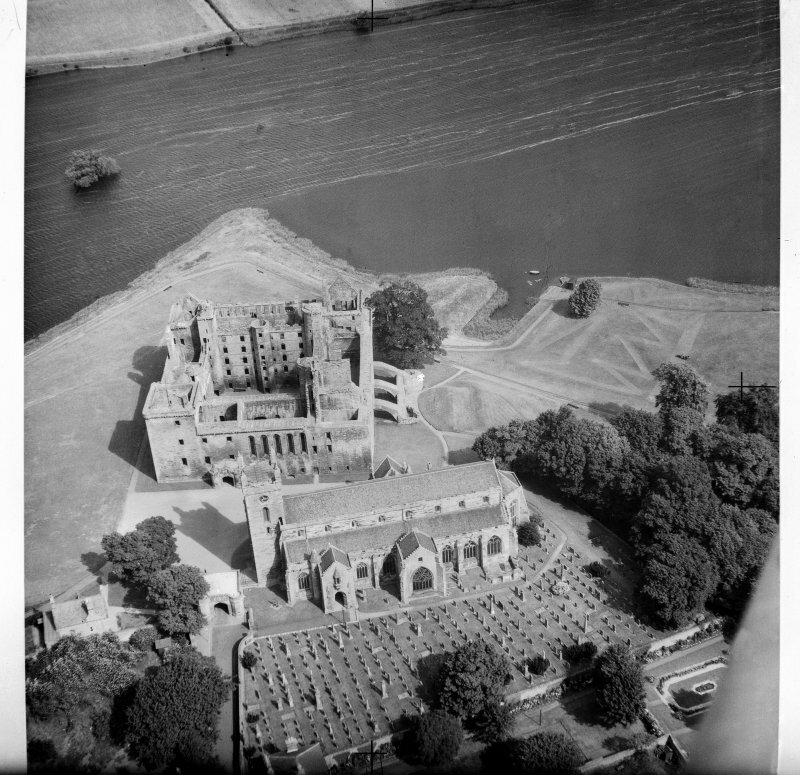 The galleries which had disfigured the east .end of the church were taken down and the choir arch was restored (MacDonald, 1932, 74). 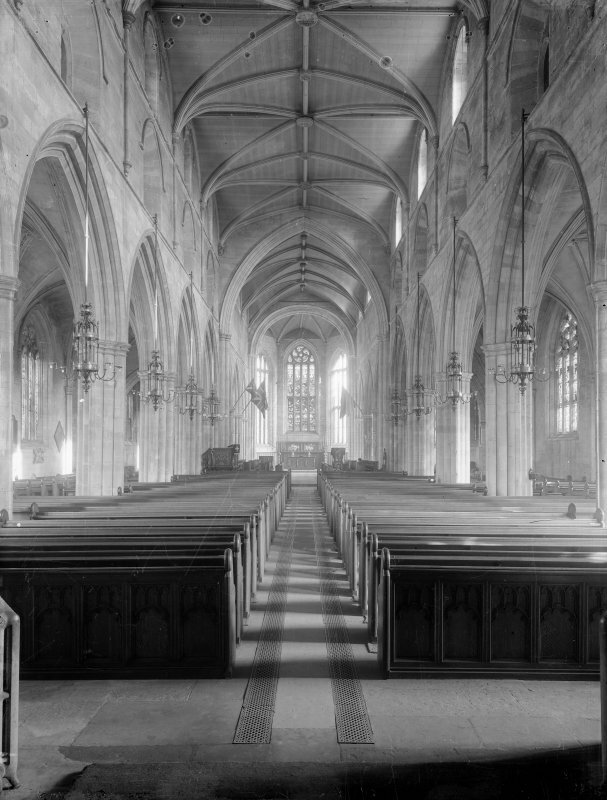 On plan the church consists of an aisled nave and choir, the latter being apsidal ended with north and south transeptal aisles. 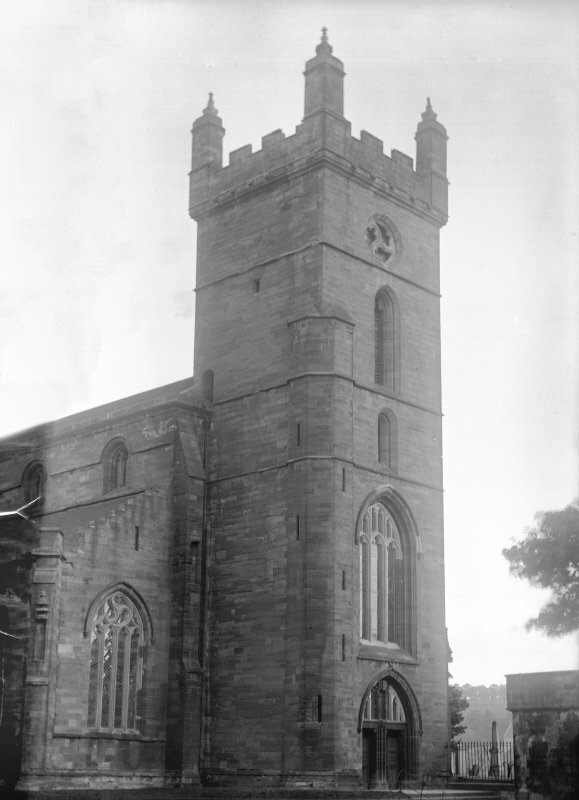 A late fifteenth-century western tower originally with a crown steeple guards the entrance to the church. 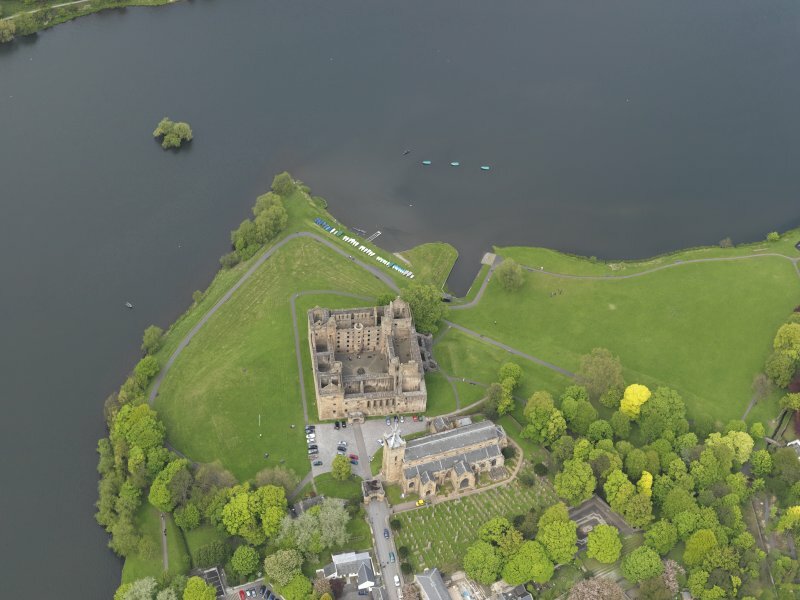 church. 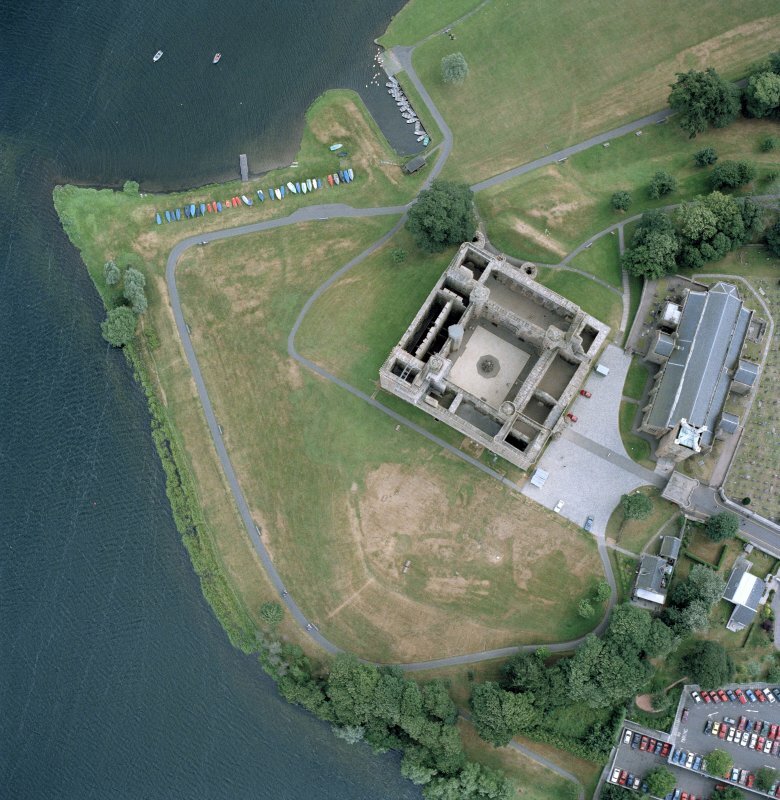 Some disarticulated human bone was recovered and subsequently reburied on site.